This section is now divided up into 4 pages. 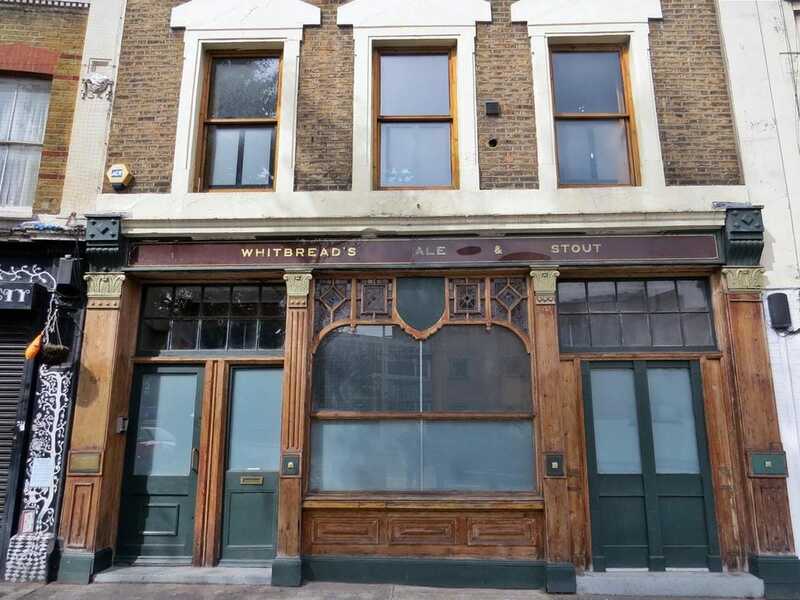 This page covers closed down and derelict pubs that have since been converted for alternative uses. 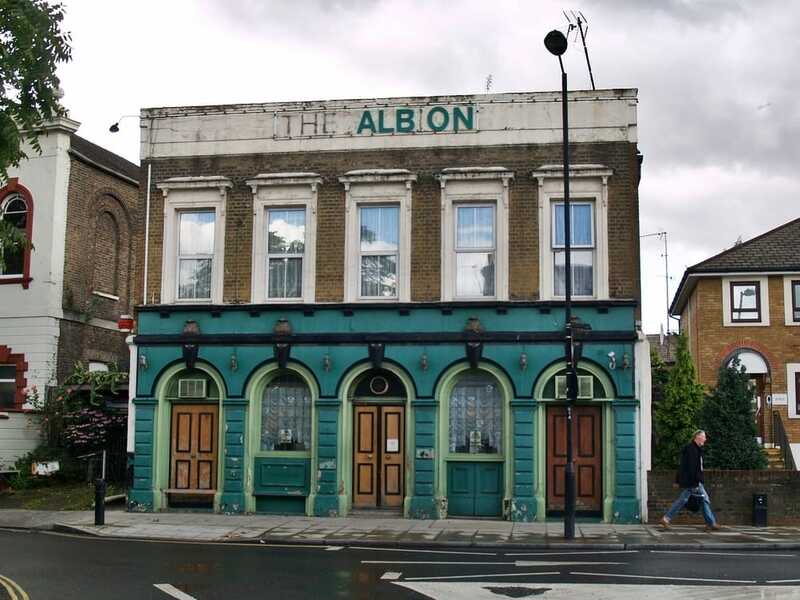 This is by no means a comprehensive guide to closed down East London pubs - just a personal collection from the eary 2000s to present. 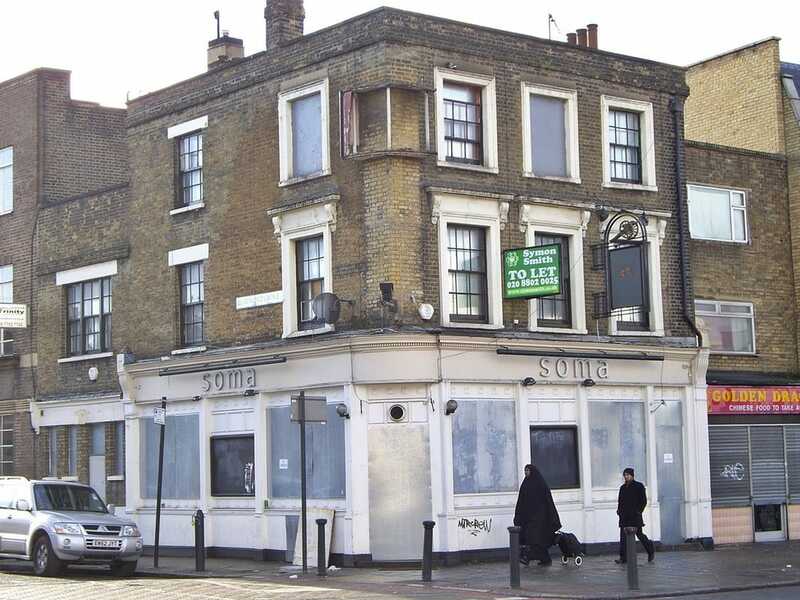 This review of the pub in the early 2000s said : "Pubs like this in the East End will be gone in 20 years time. 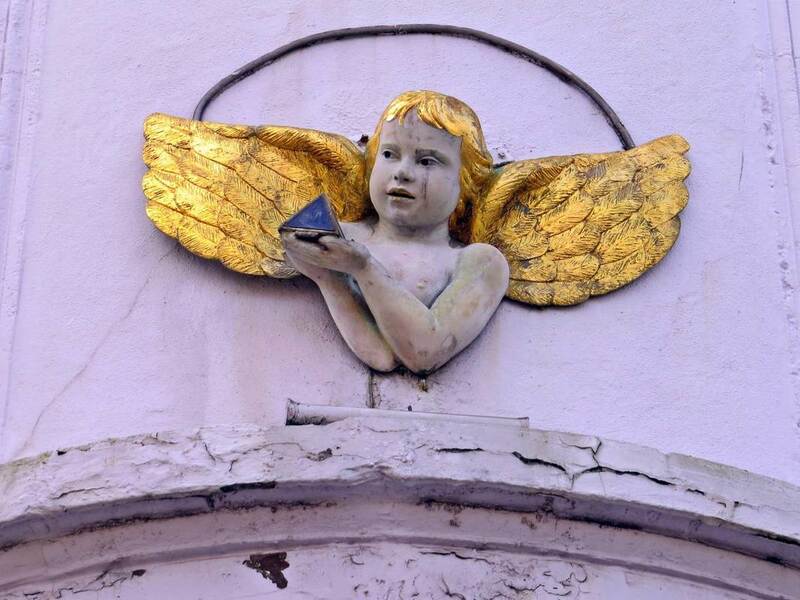 All the old locals will have died or moved away and most young people around here do not drink for religious reasons. 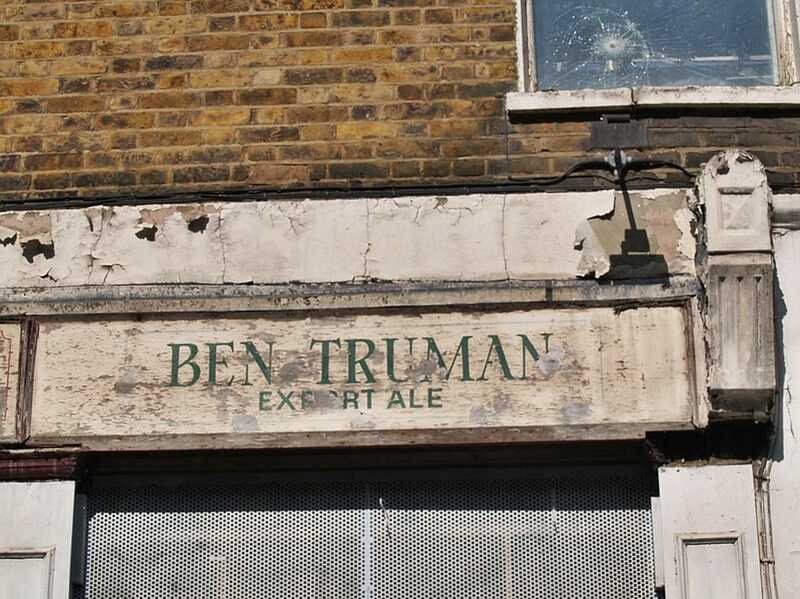 This one could survive if it is tastefully redecorated and they introduce some more interesting beers." Unfortunately, the pub did not survive and is it is now a supermarket. 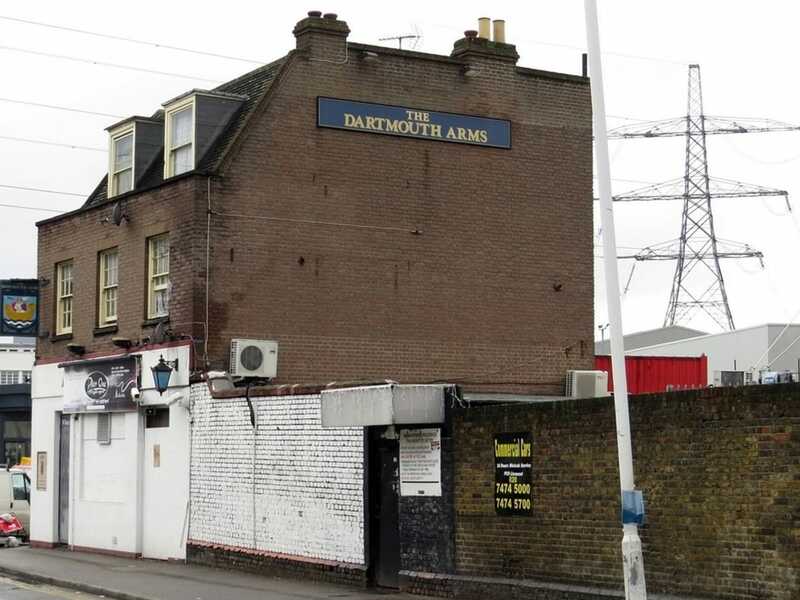 Colin Price writes: "I remember drinking here at an East London Camra social on a Tuesday night in the early 80's. Just before closing time my mate Tony and I realised that although the Three Crowns shut at 10.30pm the pubs in Woolwich would still be open to 11. so we left the pub walked down the steps to the tunnel under the river, through the tunnel and up the steps on the south side and into the Rose and Crown for a couple more pints followed by a more leisurely walk back"
Peter Barrett writes: "Many years ago, I have lived in Australia for 35 years, I lived on the south side of the river in Woolwich.There were regular fights in the Three Crowns, and the Police station was right opposite, saw a couple of blokes arrested there one night and then almost the whole pub, rush over to the Police station and set the blokes free." 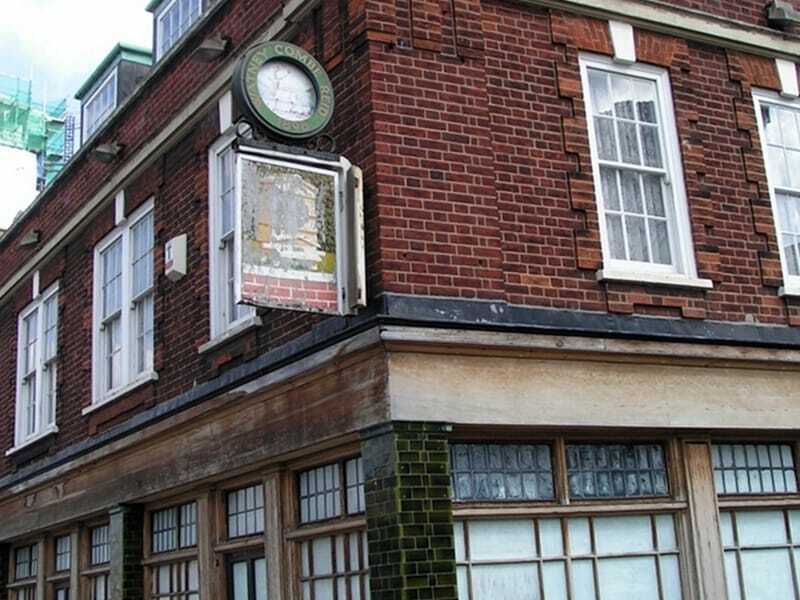 ​The Prince of Wales pub on Teale St was rebuilt after World War Two as part of a new block of flats. 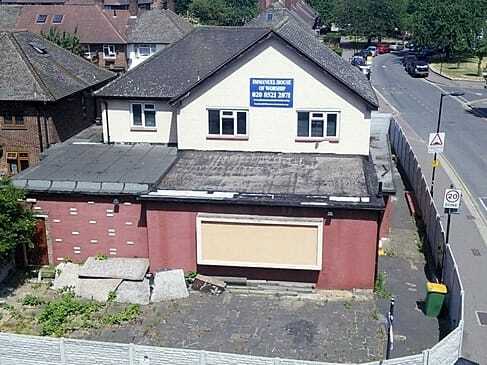 It then closed and has been converted for use by the Toucan Day Nursery. Apparently there is "bad luck" associated with this pub! I'm sure that someone will write in and enlighten us all on what atrocities occurred here? 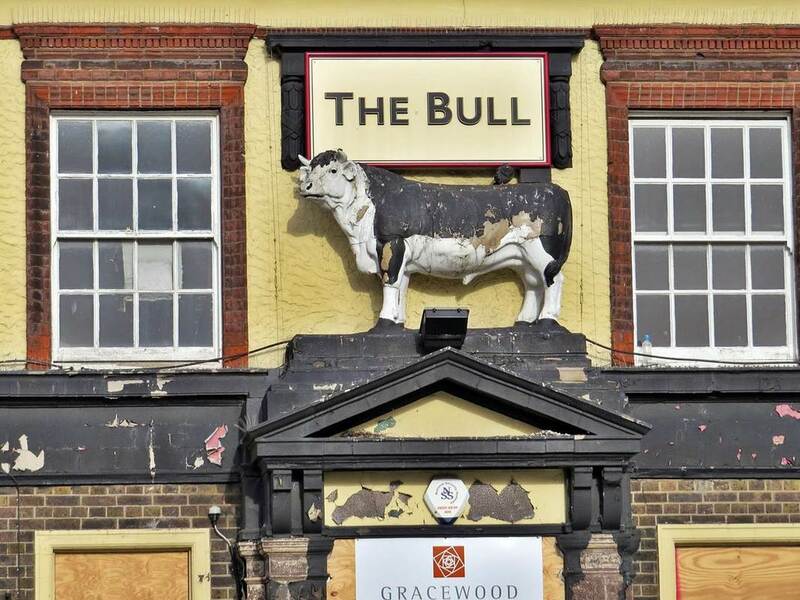 Dave Eason writes :"As a lad 1972 ish I drank here every Friday as a starter and it was deffo ground floor. 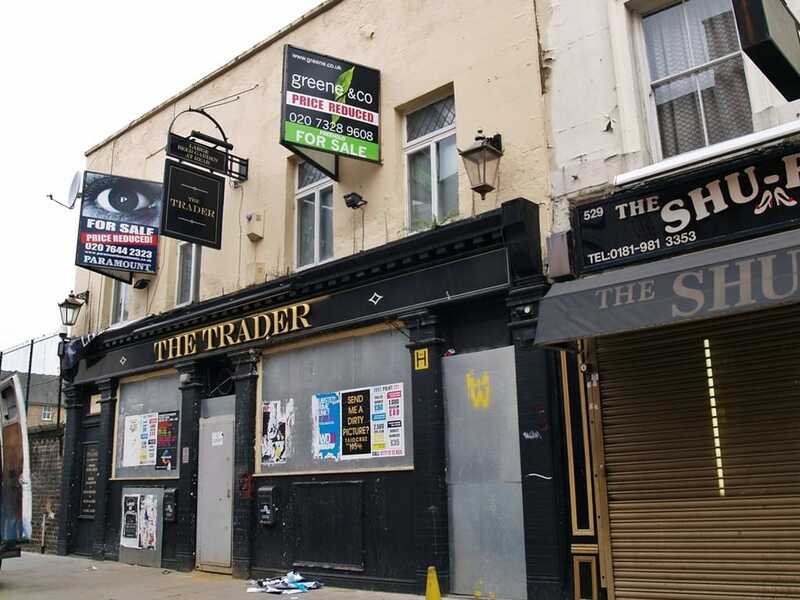 Don’t know about the bad luck stories but it was a great boozer with DJ and early Stevie Wonder stuff played often." 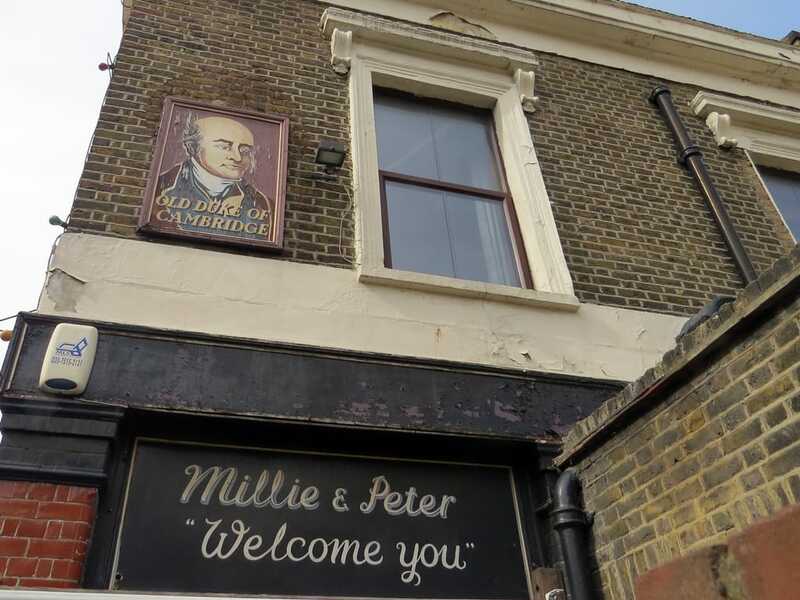 ​The Victorian pub was was rebuilt in its present form in the 1950s in this area of Pennyfields, an area where many novelists set as London's Chinatown though in reality there were seamen from all over the world living in this area. The Rose & Crown on Pennyfields closed in 2000, extended and converted to flats a few years and a piece of the original pub sign was still visible on the side of the building but that has now disappeared and the building has since undergone conversion again - ironically into a Chinese restaurant. The Survey of London: Volumes 43 and 44 - Originally published by London County Council, 1994 states: "There was some bomb damage to properties in Pennyfields during the Second World War. But by that date much of the street had already fallen into decay and many houses were in a very poor condition. 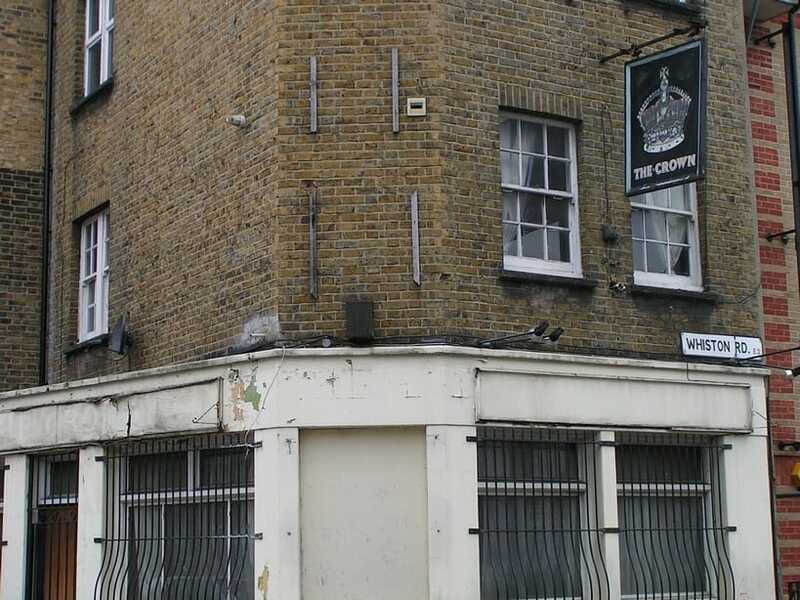 During the 1950s and 1960s both sides of the street were compulsorily purchased by the LCC, with the exception of the Rose and Crown public house on the north side, which was rebuilt in the 1950s and still stands. 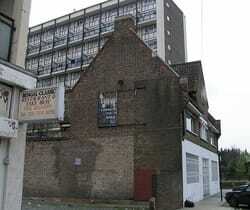 All the other properties were demolished during the 1960s, to allow the building of the Birchfield Estate." The pub used to be owned by Queenie Watts in the 1970s, jazz singer and actress who sometimes sang with an 8 piece backing band to pull in the punters.She and her husband, Slim Watts also ran the Iron Bridge Tavern, East India Dock Road (now demolished) where the Aberfeldy Village development now stands. Queenie Watts appeared on many television programmes through the 1960s and 1970s, including Romany Jones Yus, My Dear, Dad's Army, Dixon of Dock Green, Callan Beryl's Lot,Steptoe and Son,George and Mildred, the film Holiday on the Buses and in Alfie, singing "Goodbye, Dolly Gray" in a memorable, riotous bar-room brawl sequence. This Stratford High Street pub dated back to 1740 & was one of the very few remaining coaching inns on the route through East London to East Anglia.It was renamed The Log Cabin in around 2000 and closed in around 2005, shortly after receiving a Grade II-listing.The pub has now been converted into the Westbridge Hotel. I found this written about the Log Cabin on www.charlottecooper.net "The interior looked like someone's carpentry project. Hundreds of pieces of plywood scraps were nailed to the walls. The chairs and tables looked as though they had been roughly hewn out of wood. Everything was wonky, clunky, heavy. On one of the tables there was a giant egg-shaped stone, like a weird centrepiece. We would sit and drink and fondle the dinosaur egg absentmindedly. 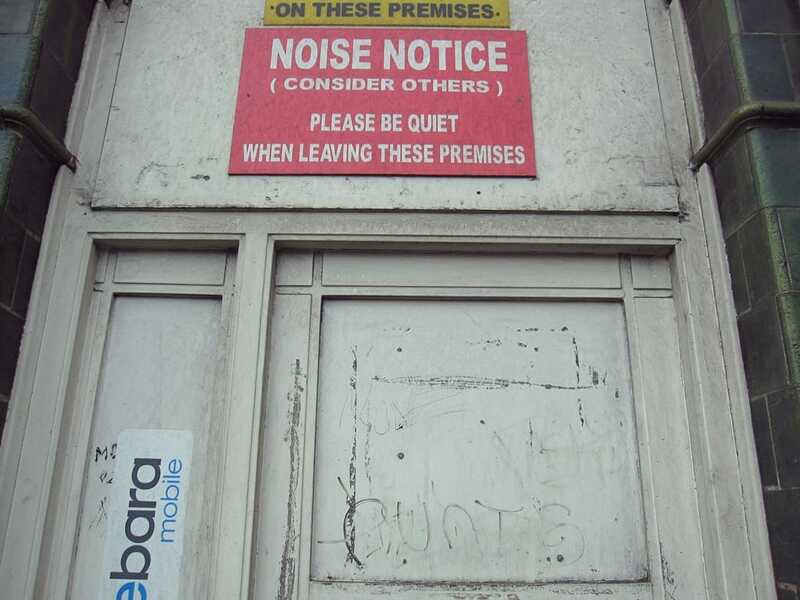 The place was rarely busy, the punters were grumps. 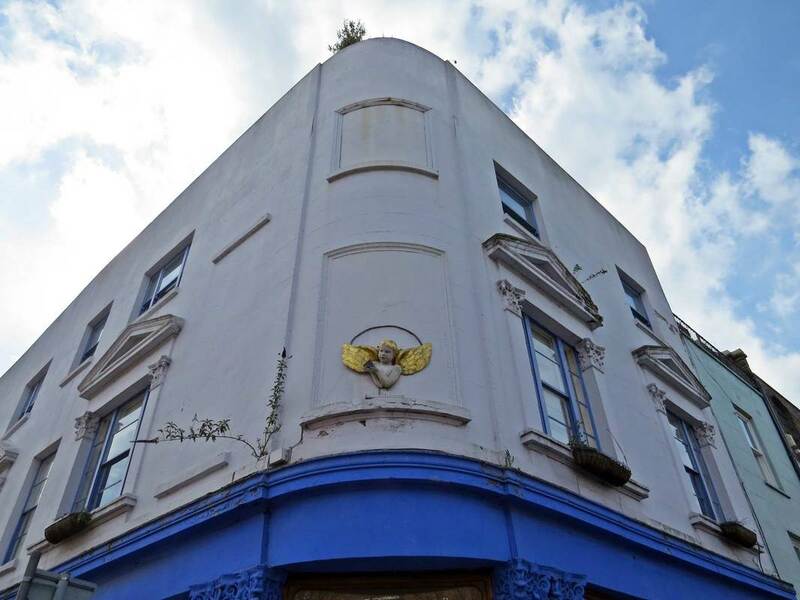 The building has just been sold for £1.4 million. 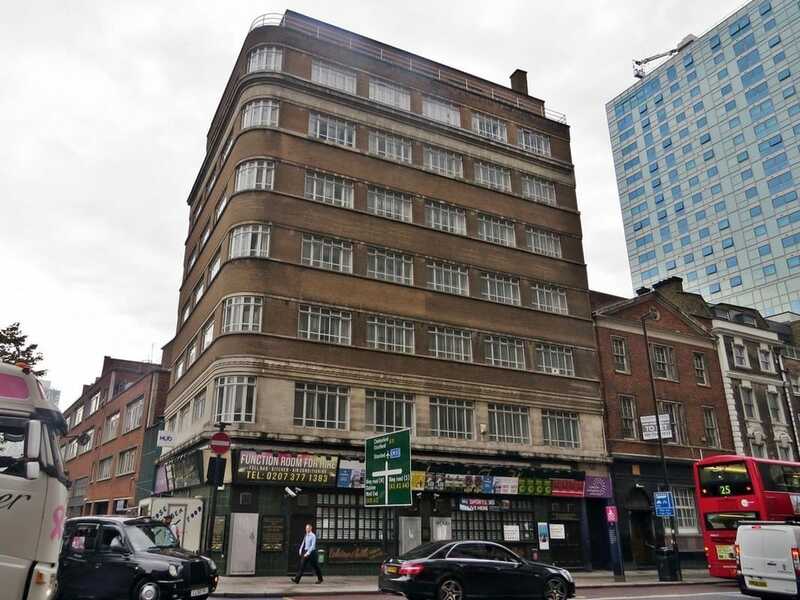 It's going to be knocked down, maybe the new owners will build some more luxury flats on the site, or another hotel." The Ratcliffe Highway murders in 1811 were one of London's most infamous murder cases.. John Williams was caught for his crimes, tried and found guilty of this mass murder. Whilst in custody awaiting execution he hung himself in his cell. His body was placed on a cart and paraded around the locations of his murders, as was the custom of the time (usually before execution). The body was then taken to a 6ft. deep grave that had been dug outside The Crown and Dolphin. His body was put in the grave with a stake hammered through his heart and covered with earth. It was the custom with suicides not to bury them in consecrated ground, but at a crossroads, so the soul had no direction to travel and to have a stake hammered through the heart. His skull was kept as a souvenir on the bar. In 1956 the local Watney Streeters - most of them dockers, descendants of an earlier Watney Street gang who defended their patch against rivals from Bethnal Green - were involved in brawls with the Kray twins and their associates. 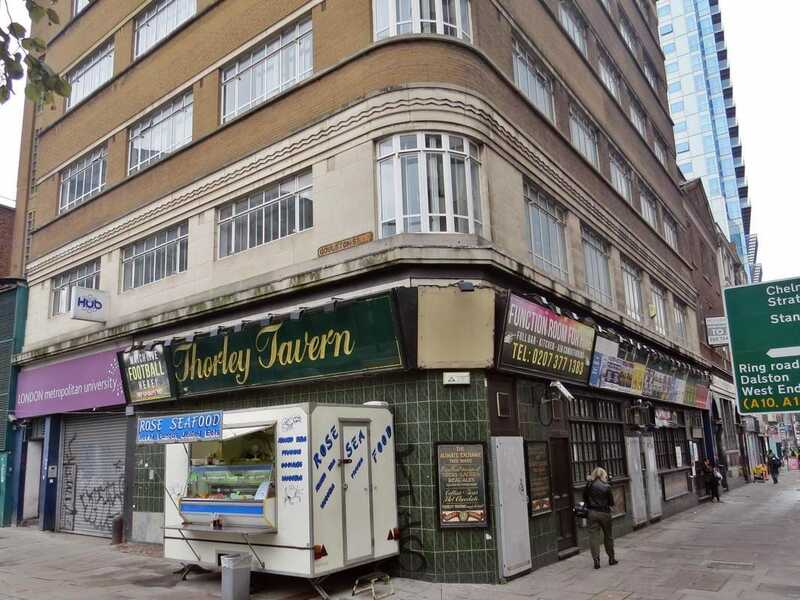 'Their' pub was the Britannia, at 44 Morris Street (run by Watney's Brewery, by coincidence), a few yards behind Watney Street: here Ronnie Kray bayonet-stabbed Terry Martin, a member of the gang, while the rest escaped through the back door. In retaliation they beat up Billy Jones, who ran a West End club, which in turn led to one of their leaders, Charlie, being 'worked over' by Bobby Ramsey at The Artichoke in Stepney Way (From sgite.org.uk).Ronnie Kray was convicted and served three years in jail for GBH and firearms possession after this incident. 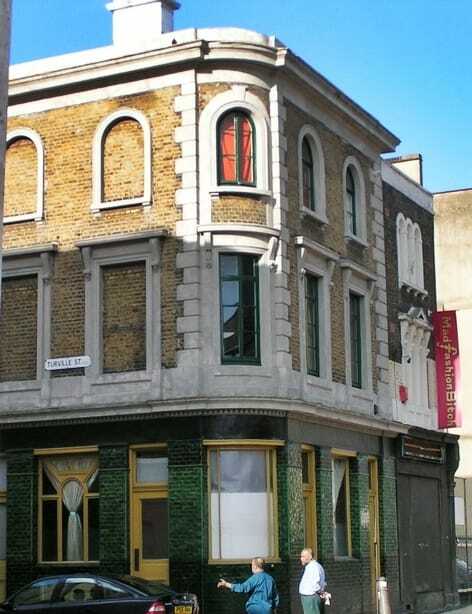 ​​The other Shadwell Britannia (aka Old Britannia) was on Cable Street and was built in 1790. 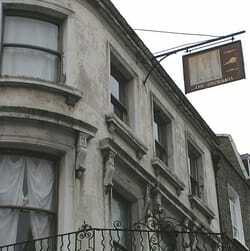 It is now the Cable Street Inn described by their own website as "a boutique bed and breakfast." Rob Syers writes: "I was a bus driver in the mid to late 90's on the route 100. This route stopped outside the Britannia and then it was looking a little careworn. I remember seeing signs for boxing exhibitions but I don't know if these ever took place." 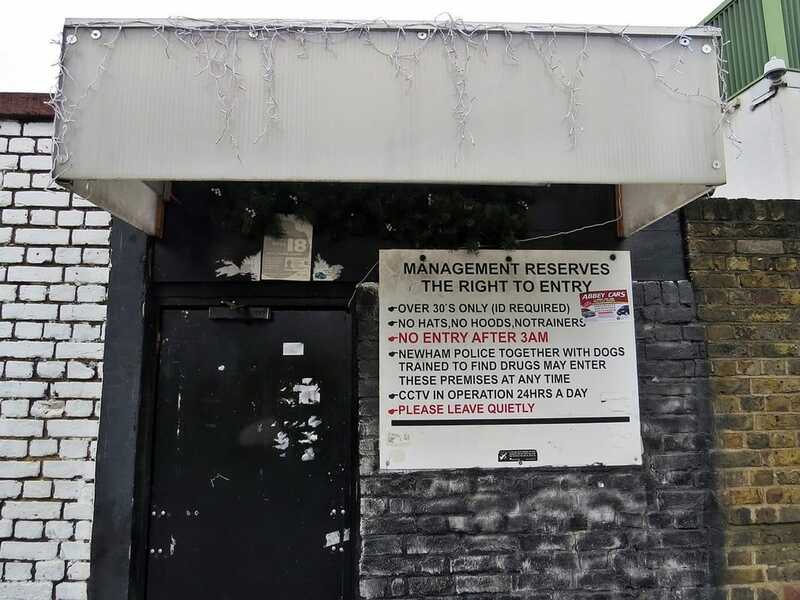 ​Just before The Conqueror on Austin Street finally got closed in 2006 it was well known for having lock-ins every night. Eventually this was so well known that it was usually busier at 1am than it was earlier in the evening and, as it's on a totally residential street, their license went. Was squatted for several years after that and now appears to have been converted into offices and flats. 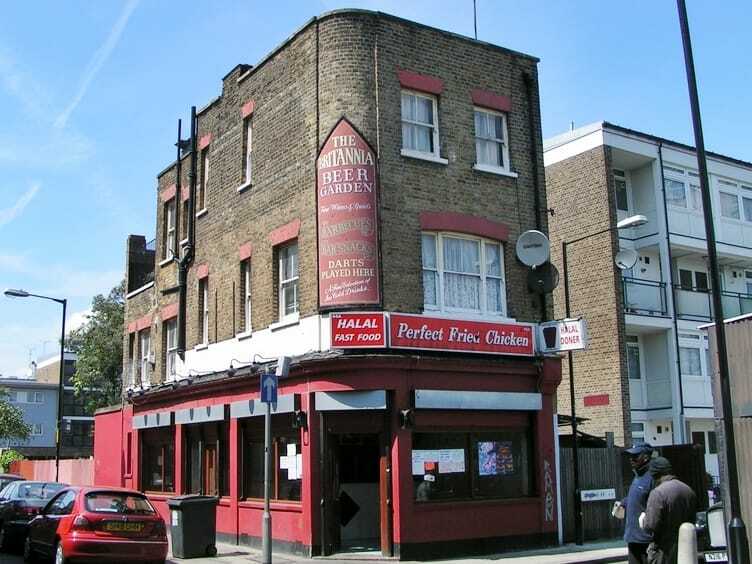 ​The Prince of Wales on Grove Road was previously called the Prince of Prussia until the outbreak of WW1. There was a murder there in 2002 when the landlord was convicted for shooting a customer in the head. 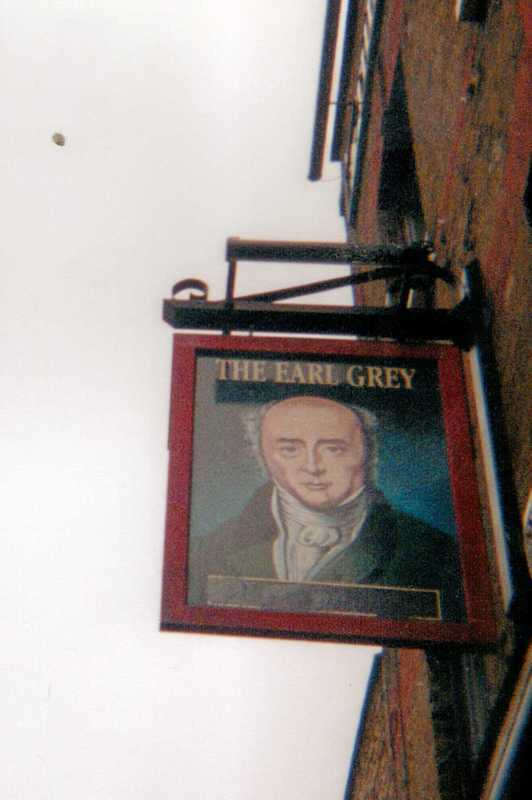 The pub eventually closed in 2005. It is now the Greedy Cow burger restaurant. Lisa writes: "we all used to go in on a Friday and Saturday night in 98/99 before we went to Benjys across the road, a place where no matter what you can always be guaranteed to bump into people you knew or lived near you, what times they were and fun the best years from what I can remember, after that everyone moved away". 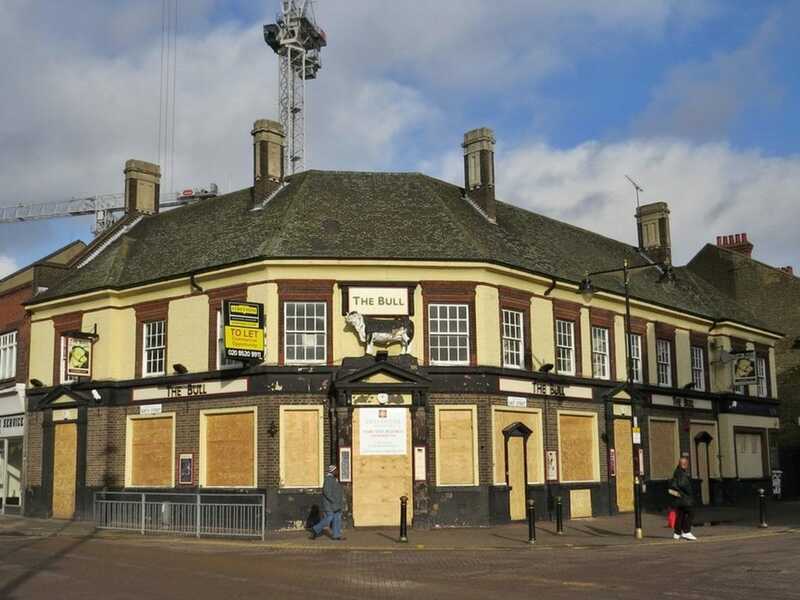 Gail writes: "It looks like this may soon be a working pub again!! The bookies has moved out and it was boarded up for a while. We feared the worst but the hipster restorers appear to have moved in. 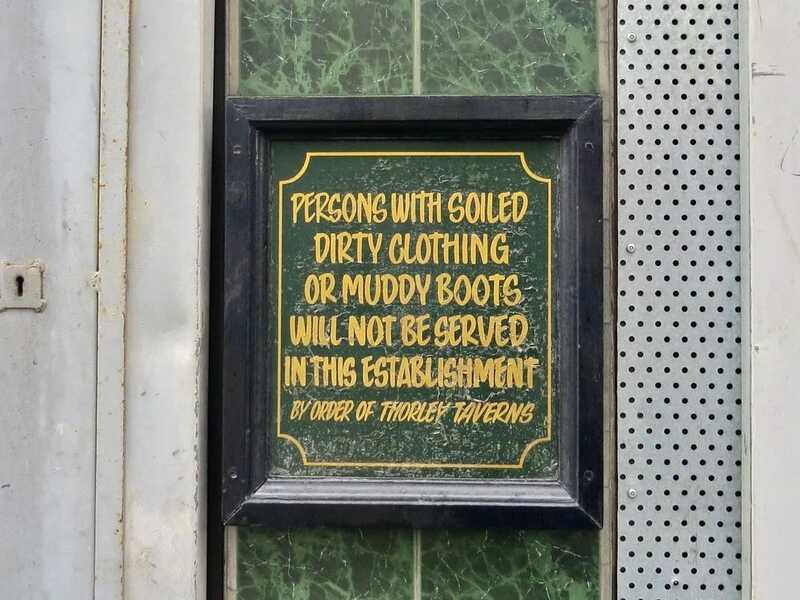 It might be worth a visit to see what they have done by revealing the old signage under the plastic fascia sings for the bookies. I'm keeping an eye on it. 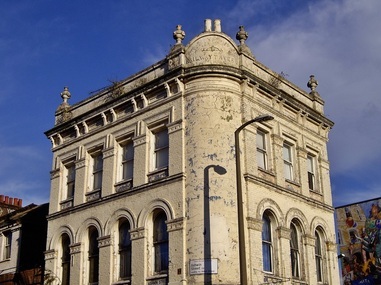 The upside of the gentrification of Dalston means there's money flowing in and a hipster fashion of keeping old buildings". 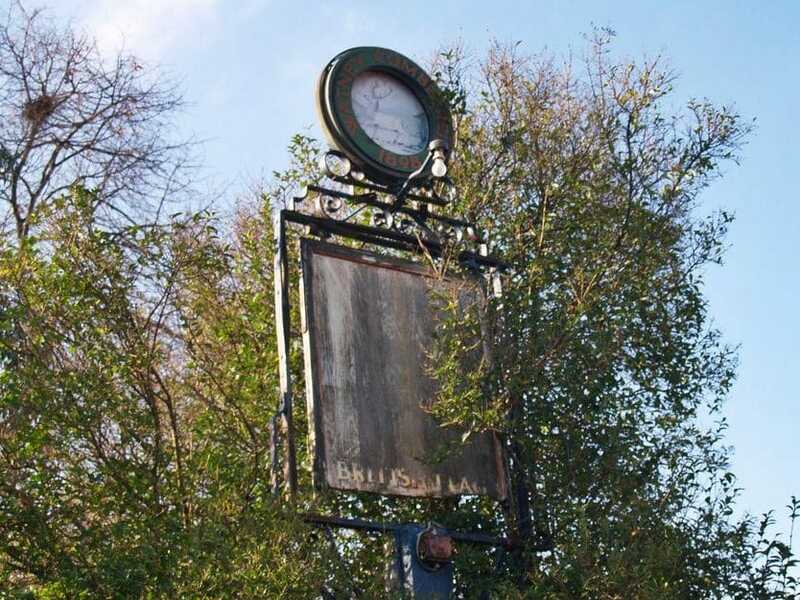 The Eagle & Child situated on Woodgrange Road originally opened in 1744 close to the original 'gate' to Epping Forest. 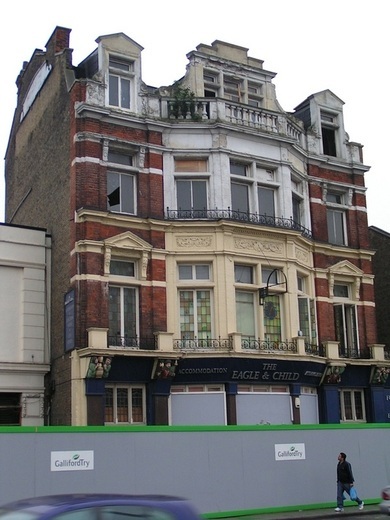 The existing building was built in 1896.Shortened to 'The Eagle' during 1990s. Closed in 2004 and converted to Raymond Chadburn flats, with a pharmacy on the ground floor. 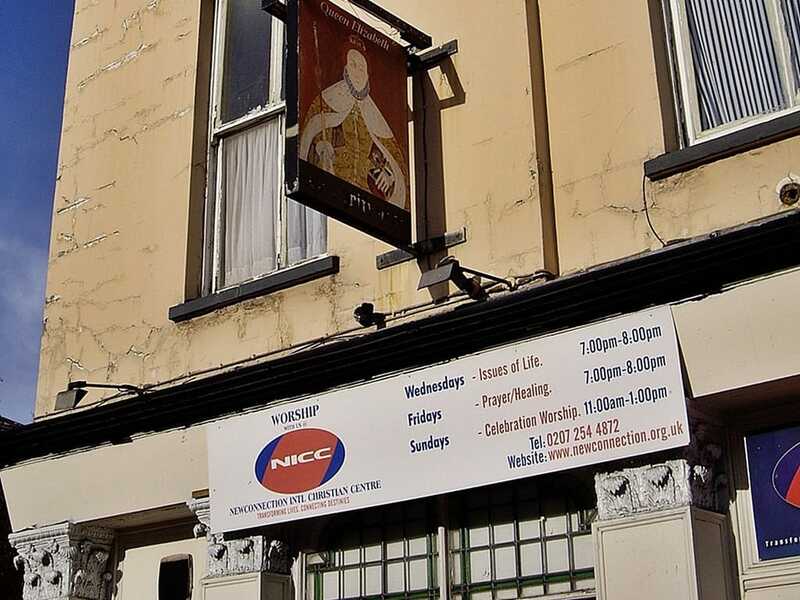 Niki Warner writes: "I held the licence on the Eagle and Child, Forest Gate in 1999 to 2000. My father in law was murdered there, 27th January 2000." 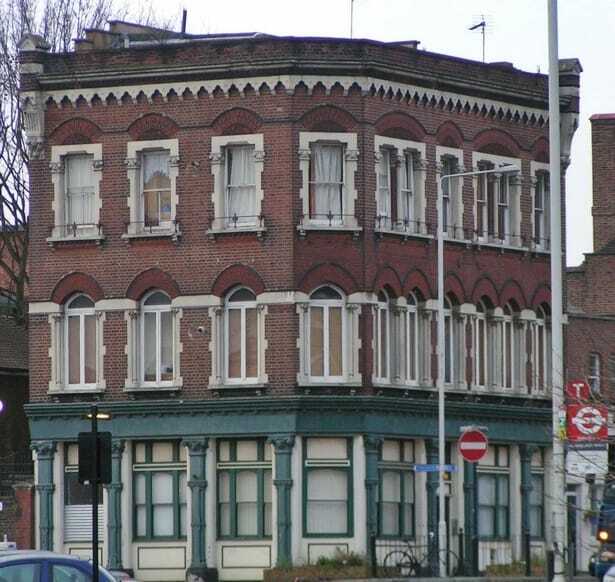 This Chatsworth Road pub was originally opened in 1872 and called the George IV before being renamed the Clapton Park Tavern. Known locally as “The Black House” because hearses used to stop there on their way back from a funeral. It closed in 2001 and became a Chinese Restaurant and now its the Venerdi Italian restaurant. 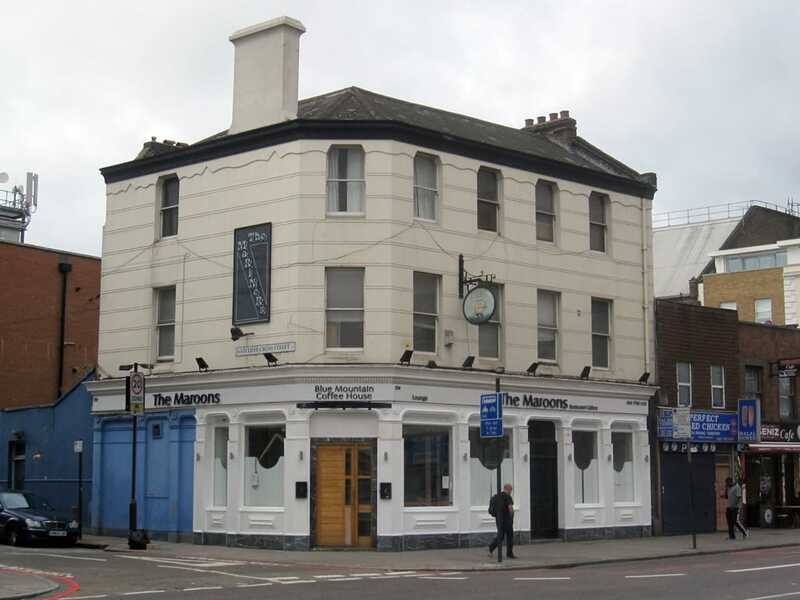 This Hertford Road pub, in recent years had Jim the (allegedly) largest landlord in Hackney area closed in 2002 and is now in residential use. 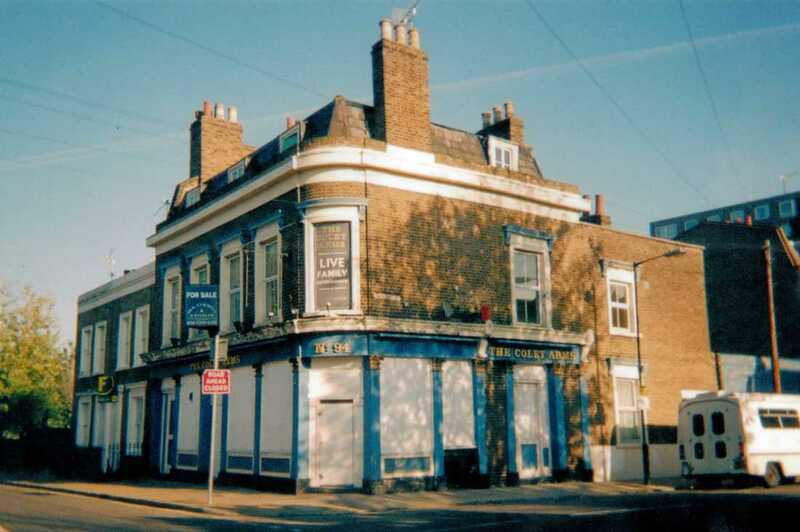 The site of the Red Lion, North Street, Barking, was home to a pub called the Blue Boar over 300 years ago, and then closed in 2008 after 150 years of trading under its current name.The pub frontage and insignia remain. Downstairs is used as an outreach centre for dependency issues including ironically Alcoholics Anonymous. Leading up to its closure the Red Lion raised £2000 for a childrens hospice. 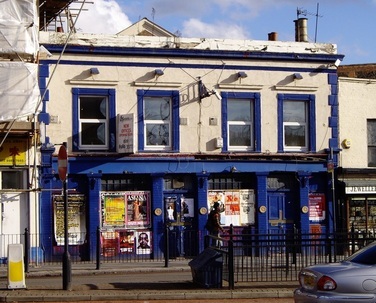 Back in 1965 the pub hosted the Berkynge Folk Club and Paul Simon,The Gants Hill-Billies & Sandy Denny all played here. 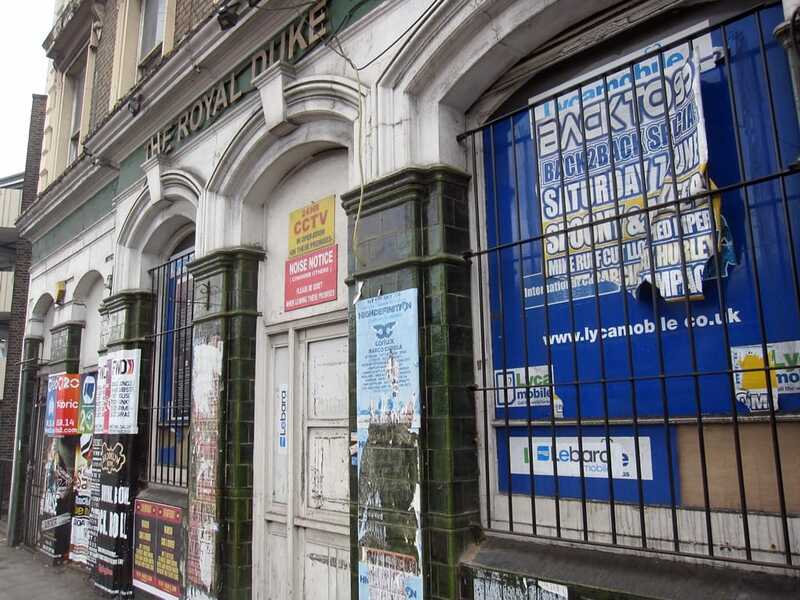 The Rose and Crown on Mare Street was renamed The Cambridge in its final couple of years. 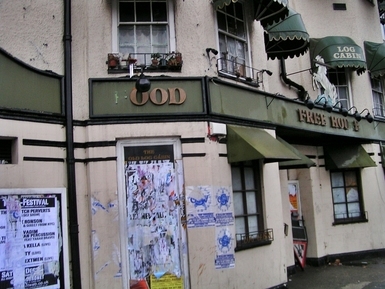 The pub hosted various jazz and alternative gigs over the years. After closure the pub became a squat and now appears to be converted to residential. 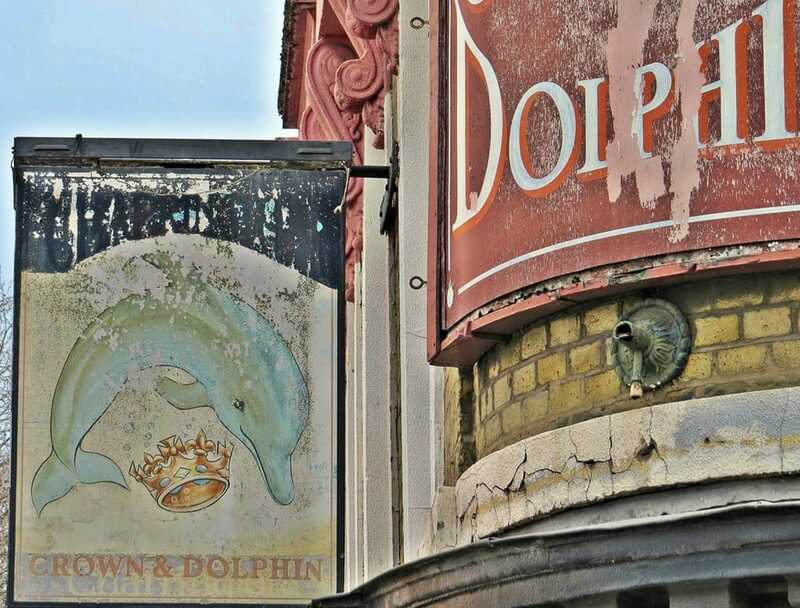 David writes to Derelict London: "Just stumbled into your site and sent me on a trip down memory lane. I was the Publican that painted the Rose and Crown (Cambridge)Mare Street Hackney in red. 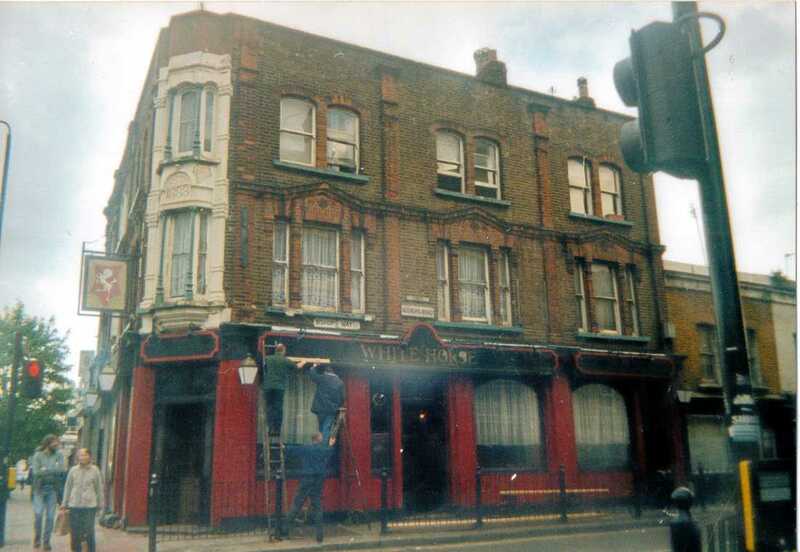 In 1992/3 after a period of being closed, Whitbread decided to reopen the pub which had fallen into disrepair after getting it back from Youngs Brewery. For one year it was run on a shoe string and due to the seating was nicknamed the sofas. They were considering closing it again when they spoke with me. I was at the time managing the Alma in Hoxton. In partnership with Whitbread I started to work on building the pub back up and we started bringing many bands through the place and we also gave the room upstairs during the day for bands to practice for free. We invested in some great sound equipment and initially things were starting to go well. We cleaned up the inside and renovated the horseshoe bar and started to do limited food. Repainted and gave the pub signage. We needed however financial investment also from Whitbread that had been promised at the start for a rear fire escape from the function room upstairs and improved bathroom facilities in order for a late night and legit music license. 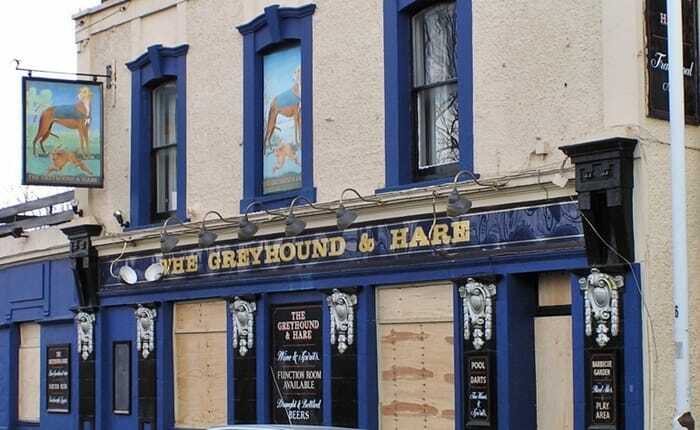 (it was a late night venue with very few houses around and the local industry had already at that time gone) I ran the pub until 2006 when after various warnings by the police I knew my next warning would see me lose my license as a publican. I contacted Whitbread, locked it up. It had an amazing garden which had been painted by some up and coming artists and a wooden sprung dance floor in the garden the shape of a grand piano. It would I believ e still be open if Whitbread had done their part." 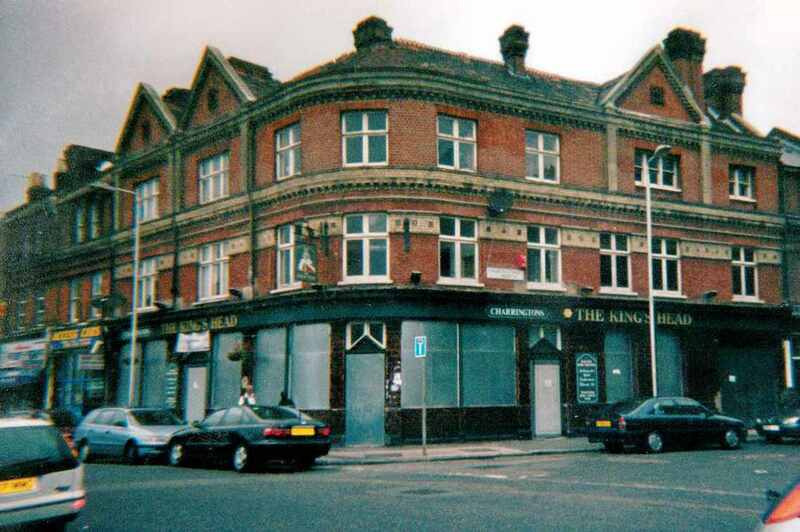 The Crown on Whiston Road closed in the late 1990s and has now been converted into flats. 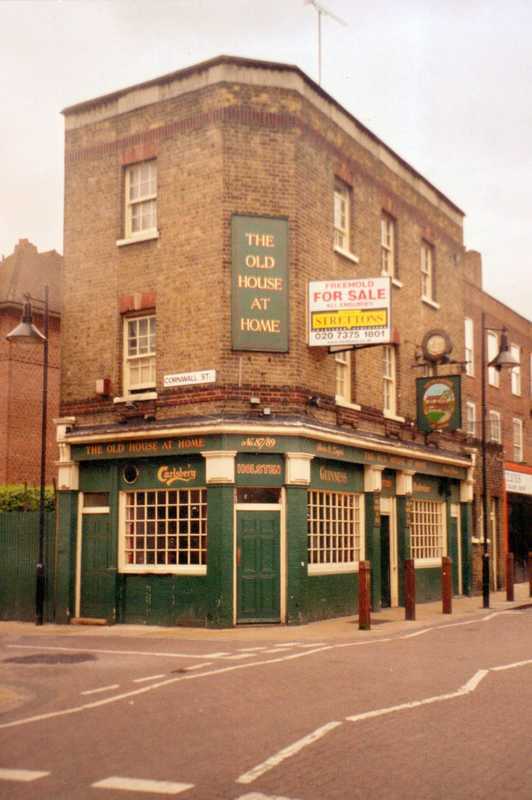 The Caledonian Arms in Fairfield Road closed in 2000 and now converted into two luxury flats. ​Nearby Fassett Square was the original set for Albert Square in Eastenders. 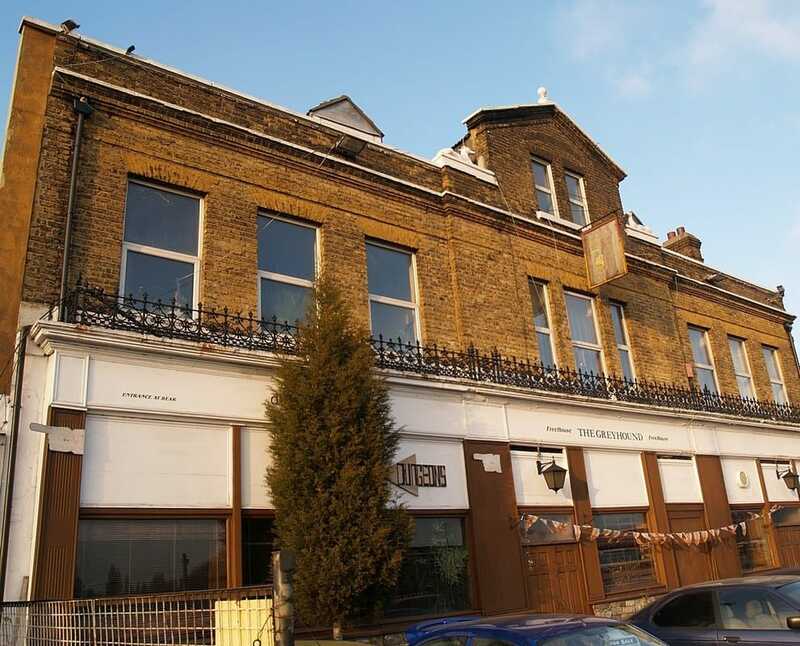 This pub the Queen Elizabeth on Graham Road was used as the model for the Queen Vic or at least if you believe the press releases by property agents who recently converted this ex pub (and briefly a church) into flats. 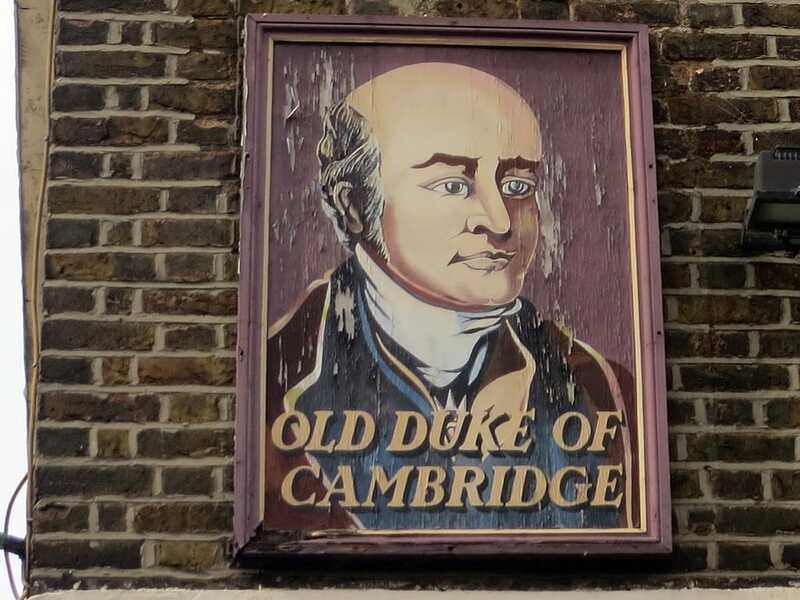 The real model for the Queen Vic is the Queen's Head over in York Square in Limehouse. The name “The Queen Elizabeth” has been reinstated onto the side of the building since this photo was taken. 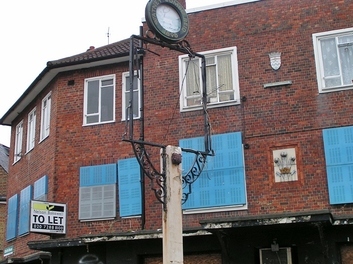 The Distillers Arms in Hancock Road opposite the Tescos has been a nightclub for the last few decades. The last time that I checked it was a Russian nightclub called Roka. The pub was for the workers of the nearby Three Mills Distillery - the Nicholson gin distiller The distillery was used in the Great War for the development of acetone supplies by Chaim Weizmann under secret conditions for the British Government. Weizmann went on to become the first President of Israel in 1948. Distilling ended in 1973 and the old distillery is now a TV and film studio. 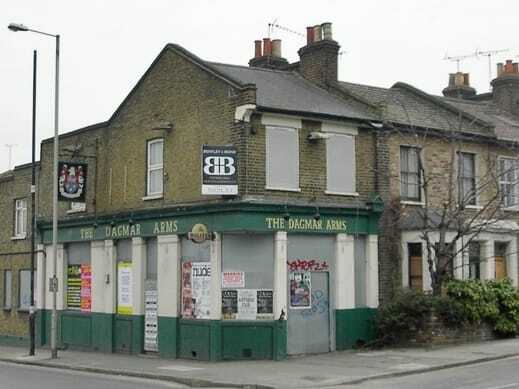 The Dagmar Arms on Danesdale Road closed in 2005. The Street was originally called Dagmar Street hence the name of the pub. The pub has been converted into a convenience store called E & E Food and Wine. 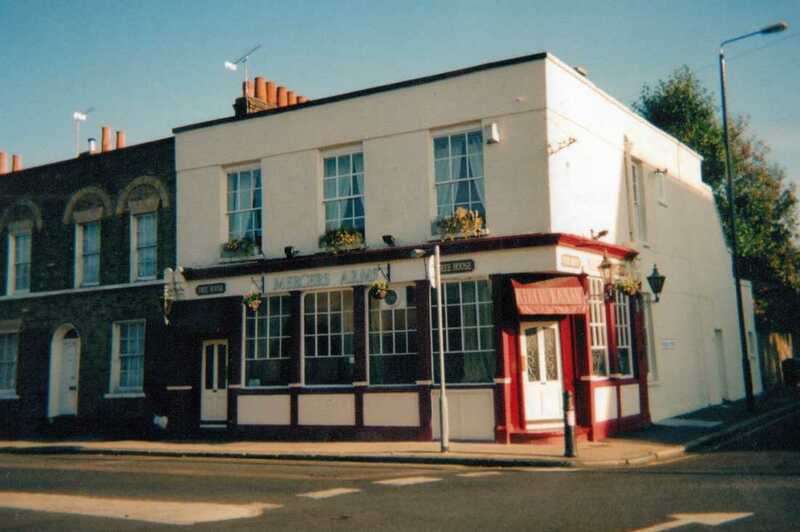 The Greyhound & Hare in Balaam Street was one of the oldest pubs in Plaistow dating back to the 1740s.It was renamed 'The Sportsman'in the 1970s before reverting back to the Greyhound & Hare.It closed in 2004 and became a restaurant. It is now Kate's Cafe. 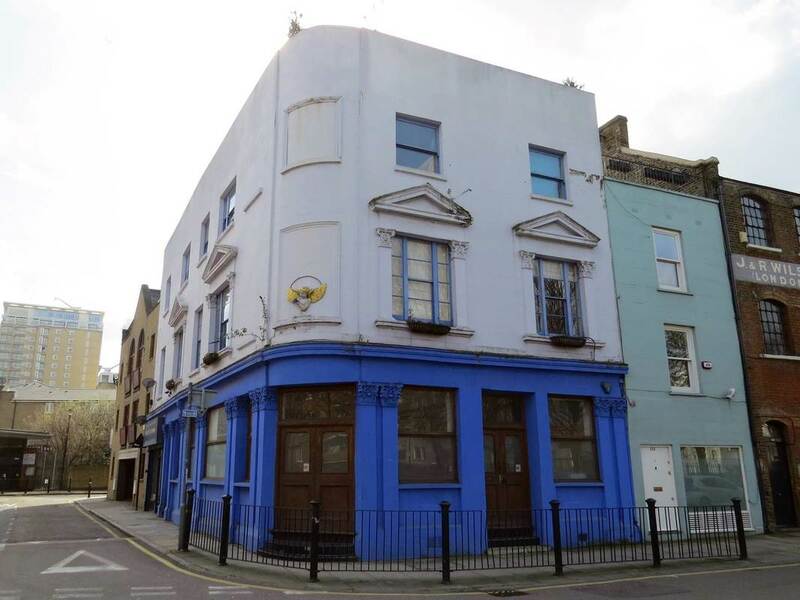 This pub on Roman Road was established as the Needle Gun by 1872 in a building which dates from 1828 and in the 1990s it was renamed the Trader.It has now been converted into the City View Hotel. 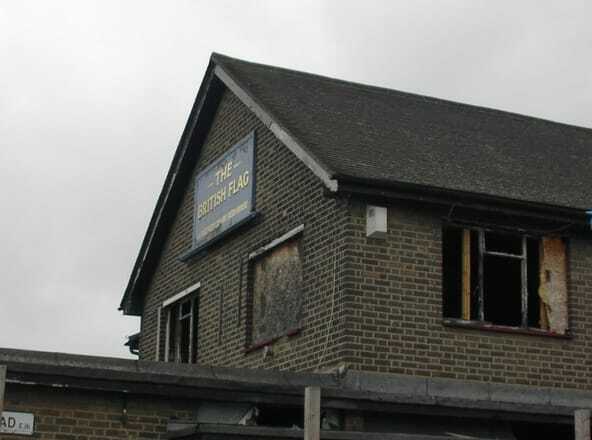 The Greyhound on the Lea Bridge Road and closed in 1997.Around the time of closure the pub hosted a downstairs nightclub called The Dungeons (the sign can be seen on this photograph taken circa 2005) This building appears to have been converted into residential use. 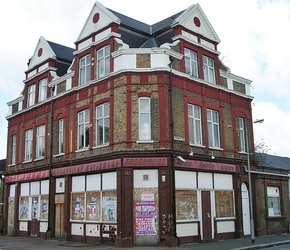 This was the once local for Orient's football stadium which used to be (a long time ago) situated around the corner but since located to Brisbane Rd in Leyton. 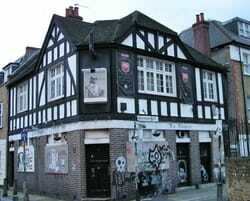 The Beehive in Roman Road closed in 1997 & is now in residential use. 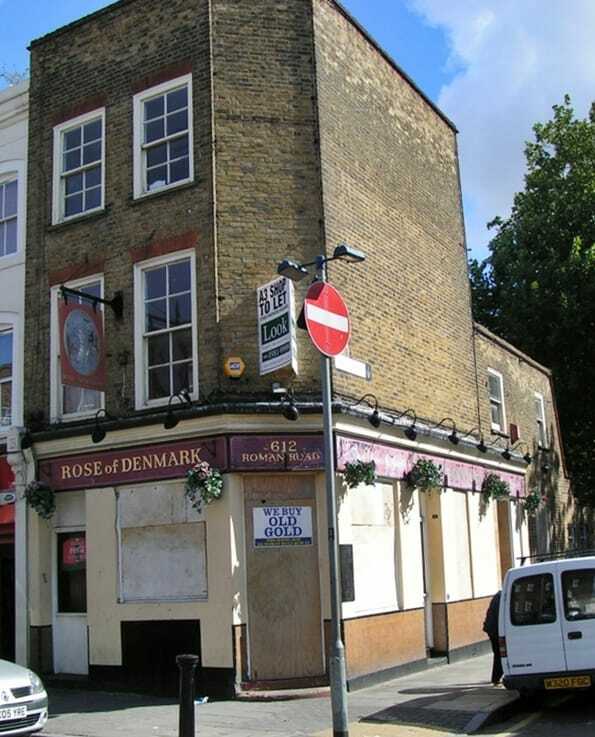 ​The Rose of Denmark on Roman Road closed in 2005 and is now Flavas Pizza and Chicken takeaway. ​The Marquis of Salisbury on Hermit Road was built c. 1881 and closed in the 1990s. The pub building remains and has been converted into flats. 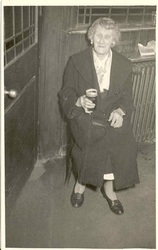 Lisa Writes: "I have attached a photograph of my great gran, Kathleen, in there circa 1950s. She was of Irish parentage and my nan told me how the Landlord once asked my great gran why she wasn't going hop-picking and she said she couldn't afford it and so the landlord paid for her to go." Just across the railway tracks from the Tidal Basin Tavern, there used to be regular nights that the drinkers of one pub would go to the other and drink there. This was a reciprocal agreement. 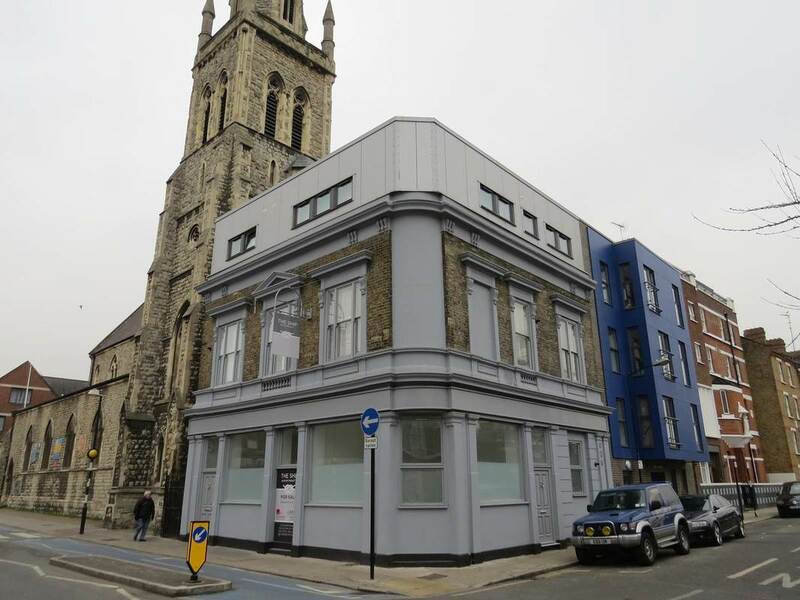 The pub building has now been restored and is being used for religious purposes. 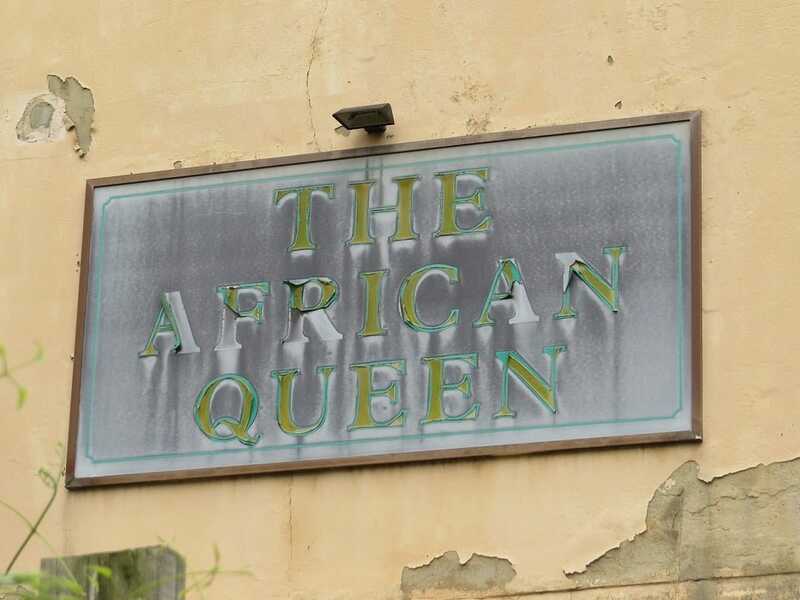 Originally named The South African Tavern then The African Tavern & from 1993 the African Queen (aka Bogarts). 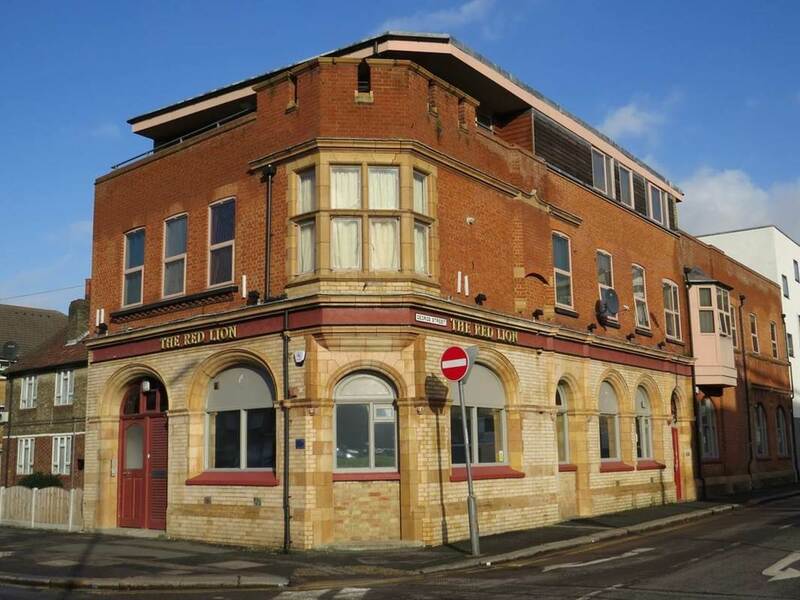 It closed in 2002 and this Grundy Street pub has now been converted to flats. 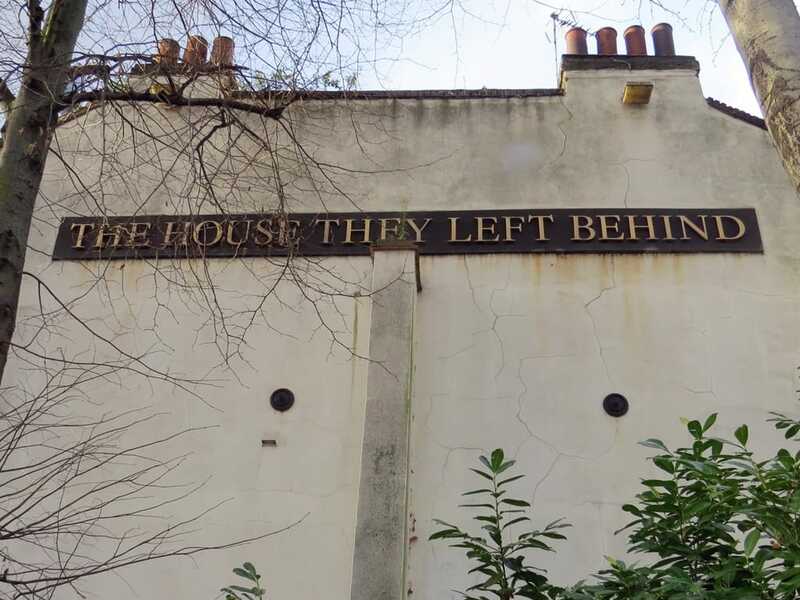 One internet source claims that Max Bygraves used to record songs in this pub. In 2014 local press reported that a man dragged a woman to an area next to the ex-pub and raped her after she got off a night bus. 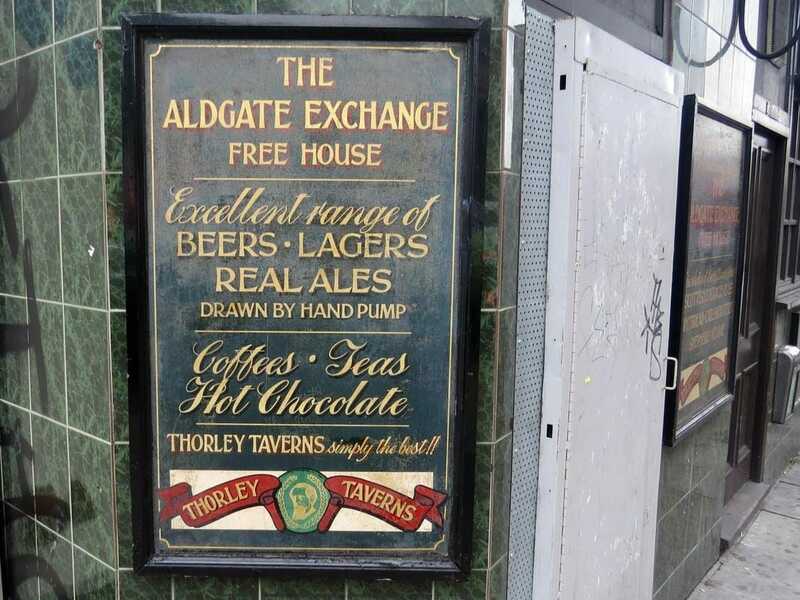 ​The Aldgate Exchange Pub on Whitechapel High St was a Wetherspoon style chain pub opened in 1997 and closed in 2013 and is now used as offices. 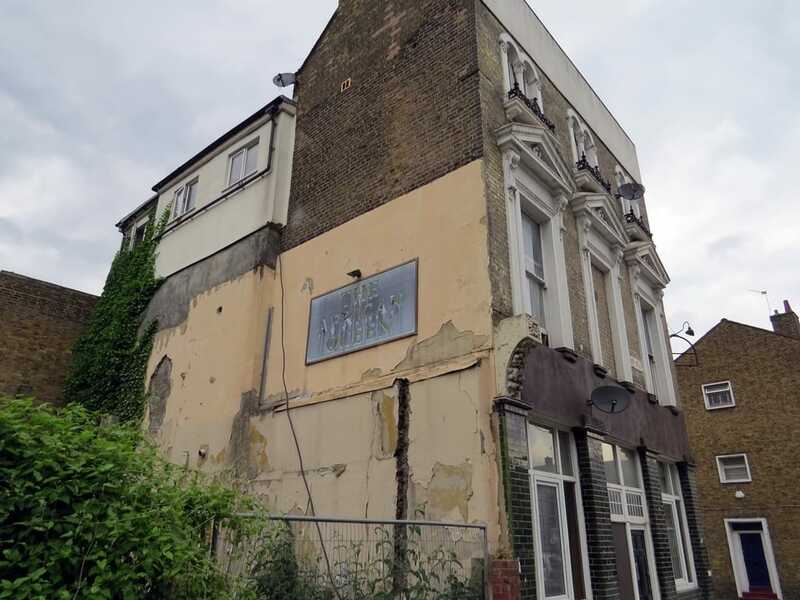 This was Thorley Taverns last remaining London pub in the final move in a plan that would allow them to re-focus all energies onto operations in Thanet. 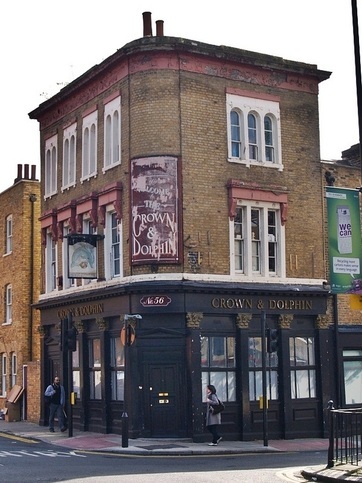 The Victorian pub on Bidder Street was once in a residential area. It was rebuilt in 1939 and limped on until a few years ago in this now light industrial area before becoming an African nightclub and now called the Pier One Nightspot. 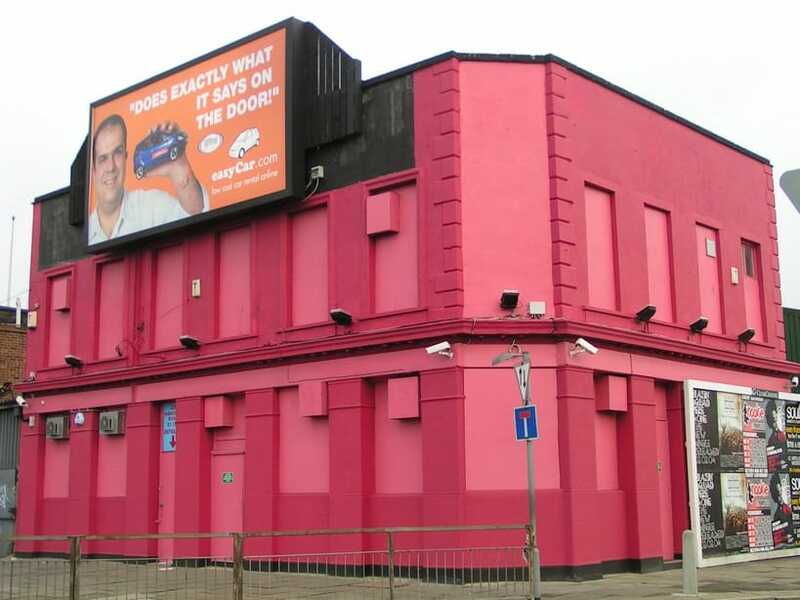 Recent permission to extend the building adding flats has been granted although the nightclub will continue. 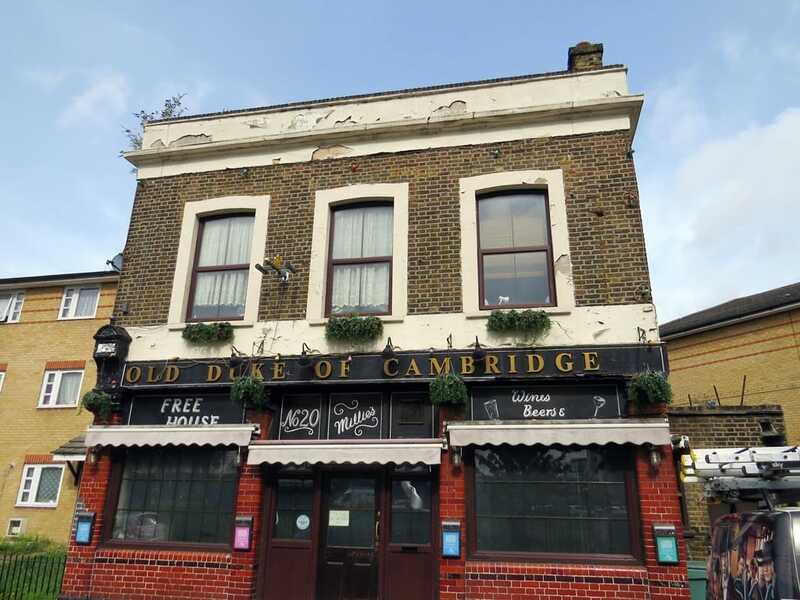 The Old Duke Of Cambridge on Reeves Rd closed in 2013 and & has been acquired by a property developer. 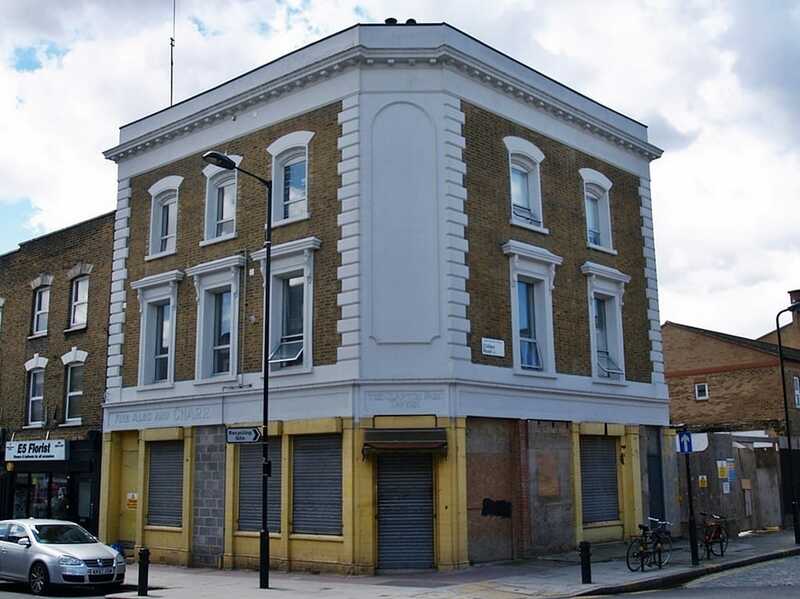 It is currently being used as residential though doesnt appeared to be converted into flats yet so appears quite untouched.Millie the elderly landlady up until closure was well known for serving up complimentary sausage rolls & snacks for the customers. 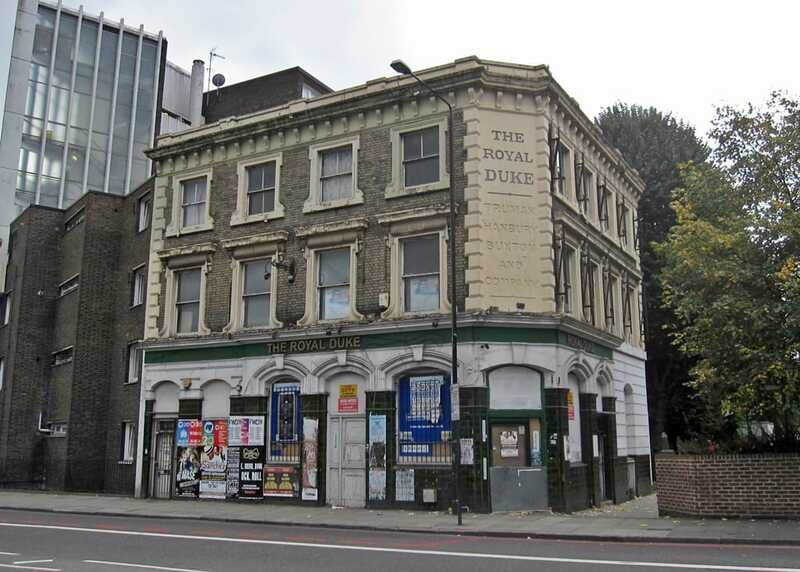 The Royal Duke on the Commercial Road. 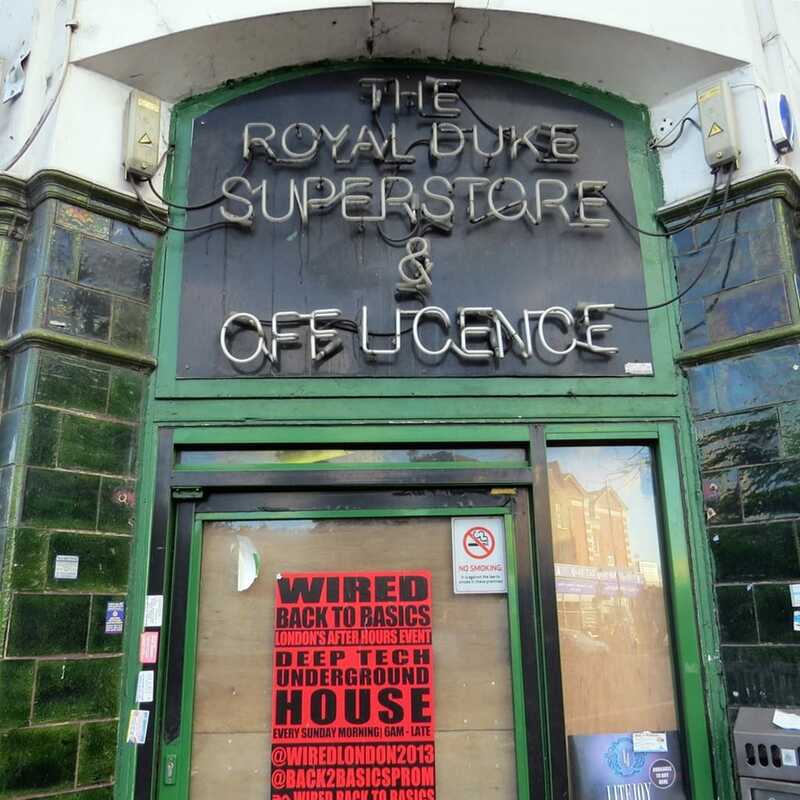 closed in 1995 and then used as a grocer's store/off license but closed in 2010 after the premises license was revoked in 2010 following a review triggered by the Police and supported by a large number of local residents. The review related to the licensing objective of ‘the prevention of crime and disorder’ following the seizure, by officers from HM Customs and Revenue, of 153 bottles of wine on which duty had not been paid; and the sale of alcohol to an under aged customer witnessed by Trading Standards Officers. 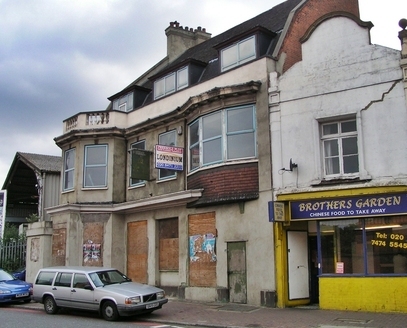 Despite its derelict appearance the pub is being used for residential purposes. 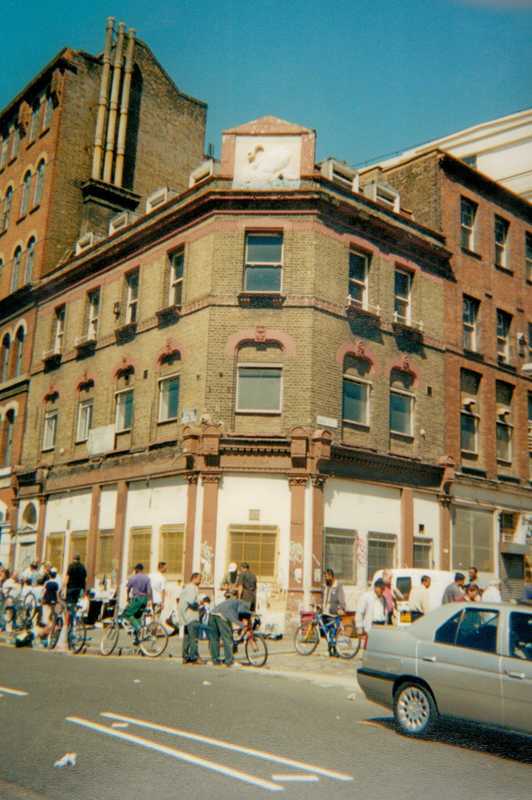 The Marquis of Lansdowne on Cremer Street closed in 2000 and is currently offices for creatives. 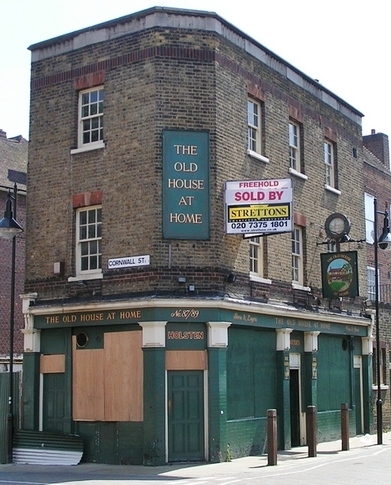 The pub was scheduled for demolition by the adjacent Geffrye Museum. The director of the Geffrye Museum said in 2013 that he had “no interest in the culture of the labouring classes”.This caused uproar by campaigners as if it were not for the ‘labouring classes’ the Geffrye, a museum about the history of furniture, would not have a museum. 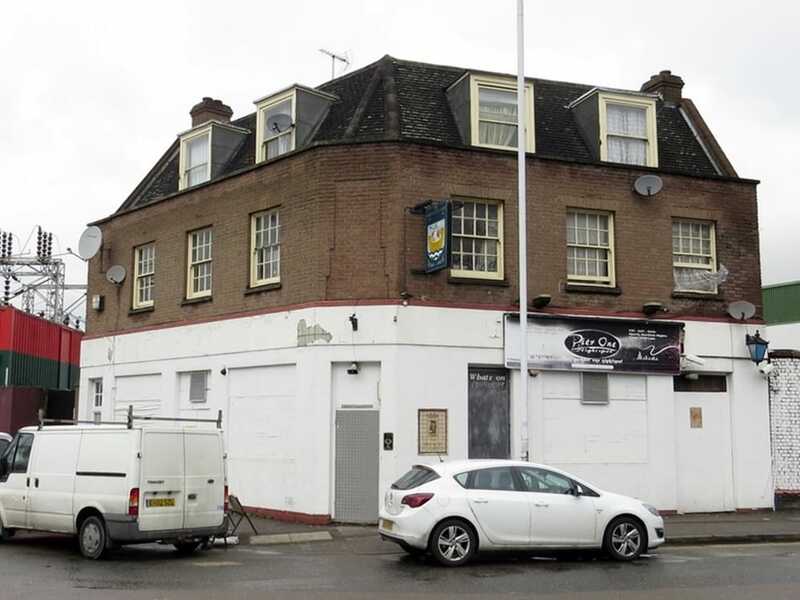 A scheme has now been approved for erection of a 4 storey building on land adjacent to the pub and various extensions to the pub to provide residential accommodation and a cafe at ground floor level. ​​The Avenue Hotel, known locally as the Flying Bottle by locals, on 90 Church Road closed in 1990 a couple of years after a murder taking place in the pub. The building has been converted into a Hindu temple - the London Sri Murugan Temple. 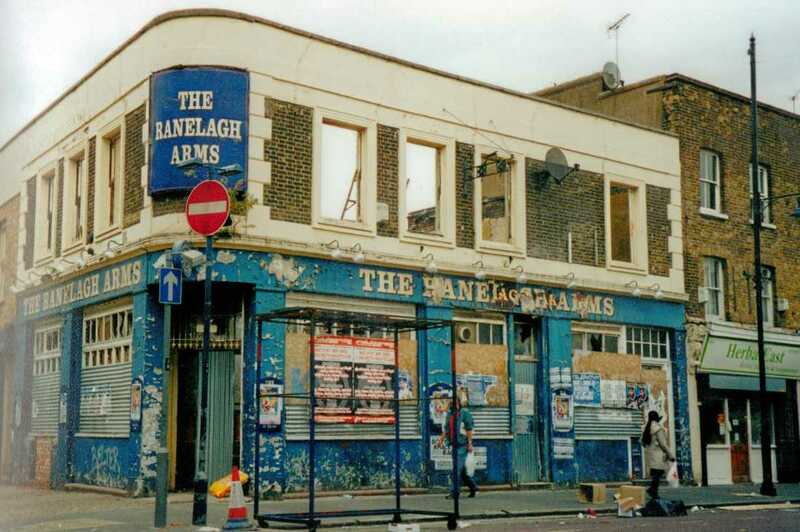 ​The Ranelagh Arms on Roman Road closed in 2000. The building - well, at least it's shell, has now been converted into a grocers & off licence called the Inci Food Centre. The Colet Arms on White Horse Road. The pub was named after the founder of St Pauls School in 1509, Dean of St Pauls Cathedral,John Colet, who lived in White Horse Road. The pub closed in 2003 and is now in private residential use. 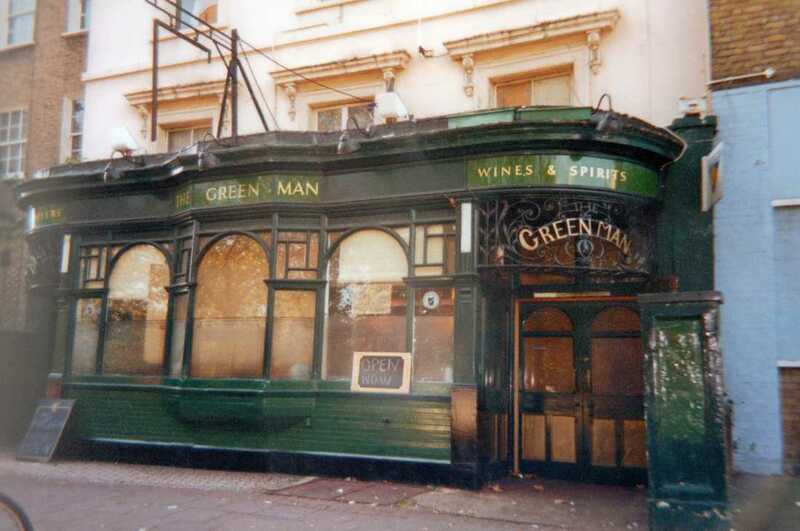 The Green Man on Cambridge Heath Road dates back to 1750 and was rebuilt in its present form in 1885 and closed in 2001.The building still exists and the ground floor is now a takeaway - Mr Cod and the upper floors are the City View Hotel. 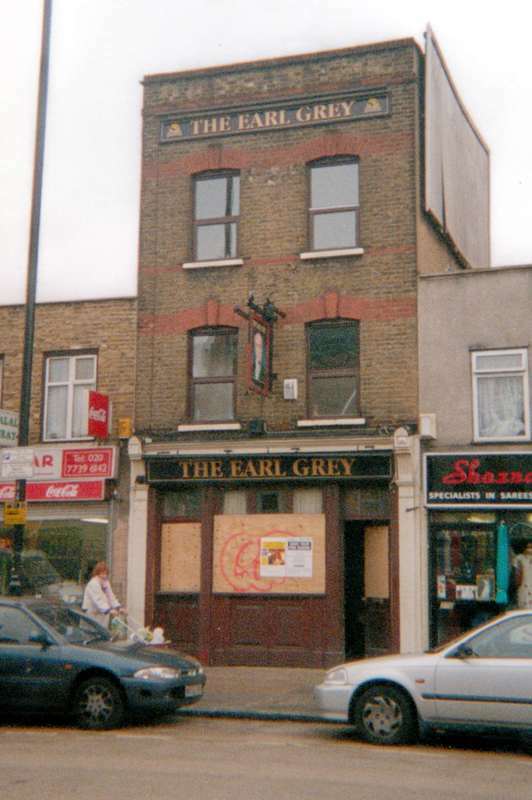 The Mercers Arms on Belgrave Road closed in 2006 soon after this picture was taken and after a period of being boarded up it has been converted to a residential development called Mercers Place. The pub was named after the Worshipful Company of Mercers - the Company's aim was to act as a trade association for general merchants, and especially for exporters of wool and importers of velvet, silk and other luxurious fabrics (mercers). The Mercers had many associations with this area. 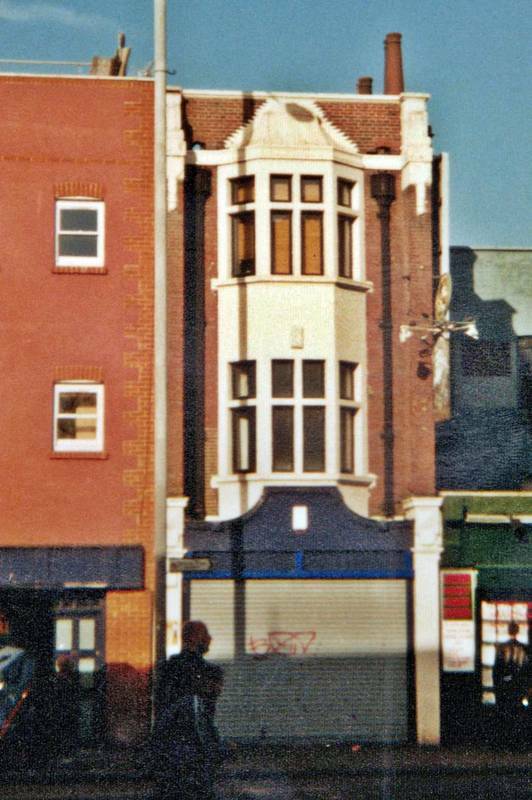 The Old King's Head on the Upper Clapton Road closed in 2000 became a Thai restaurant called Bagabon which lasted for 5 months. 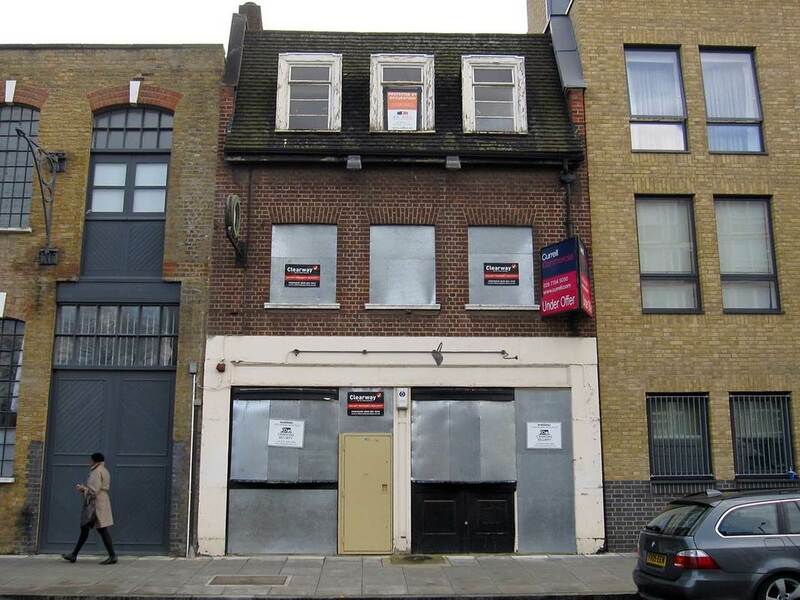 The rest of the pub was converted into flats but the ground floor appears to remain vacant. 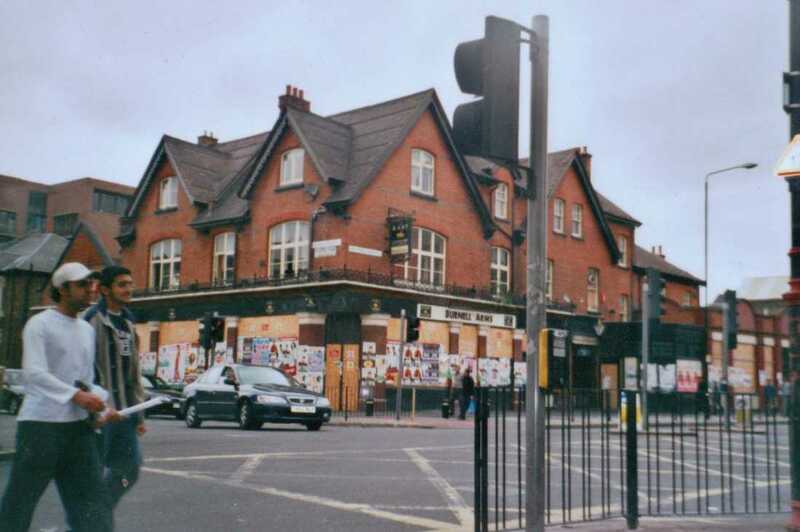 The White Horse on Cambridge Heath Road closed in 2005 and doesnt appear to have been occupied much since apart from a few "pop up" party nights in 2009. The ground floor has been converted into two retail untils but dont appear to be occupied yet. 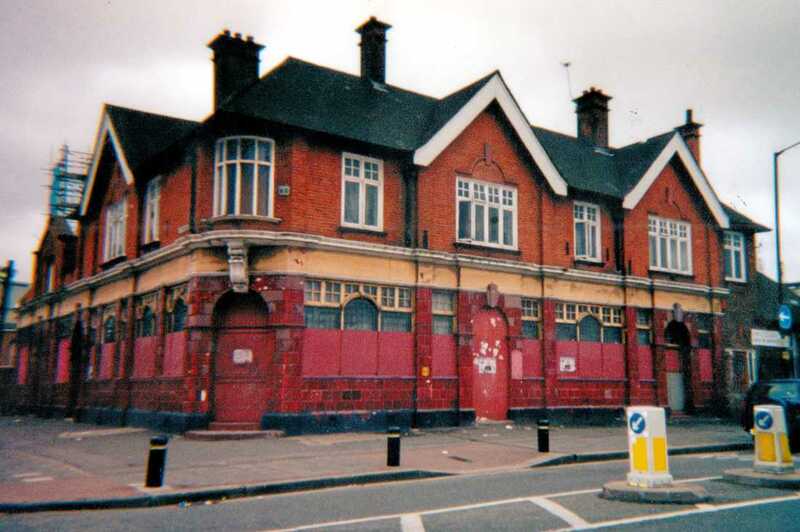 The Duke Of Devonshire in Darnley Road was closed in 2002. 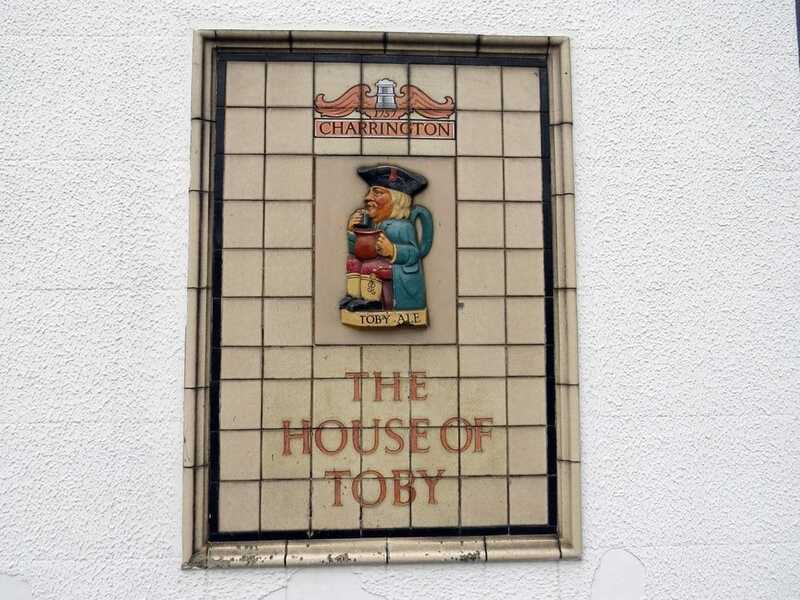 The single storey part of the pub has been demolished and replaced by a 4 storey newbuild block adjoining the main pub building which has also had a roof extension. 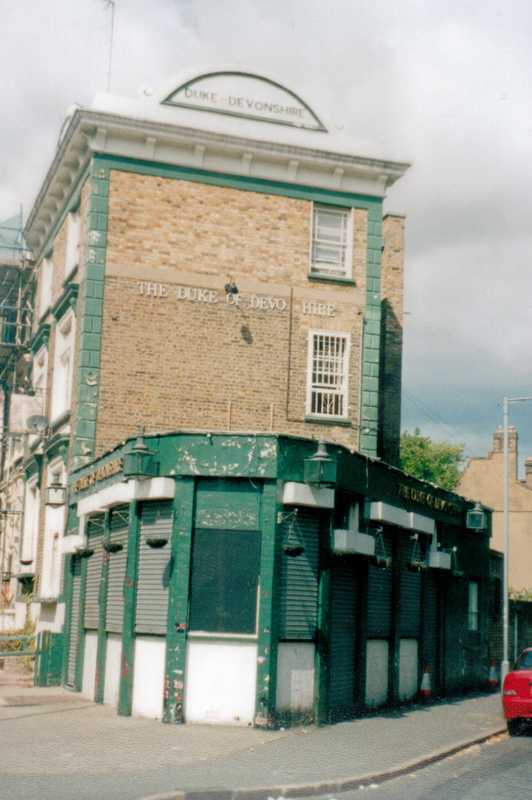 The Black Boy pub on the Mile End Road stood on this site since 1750 though rebuilt in 1904 after the whole row of buildings was demolished due to the construction of an underground station.It was renamed the Farmers Arms in the 1940s and reverted back to the Black Boy in the 1950s before becoming Fifth Avenue nightclub in 1985 before closing for good in 1996. 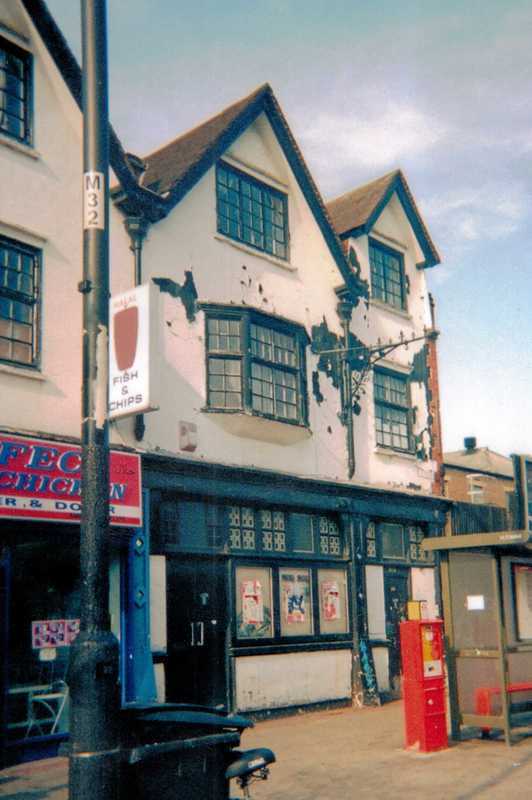 After many years of dereliction it was converted into 2 shops and currently is home to Stepney Fried Chicken and Sweet (a patisserie & dessert shop). There are rumours on Twitter that Anita Dobson (onetime Angie Watts in BBC Eastenders soap) once worked here as a barmaid. 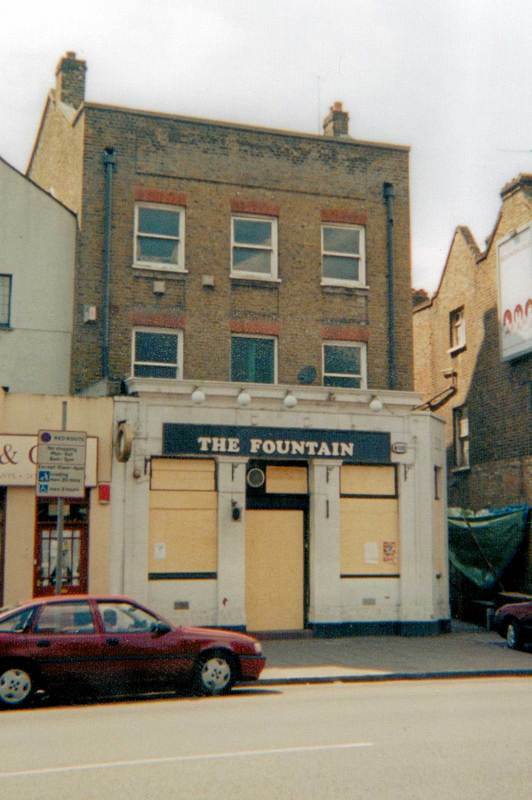 The Fountain on Lower Clapton Road closed in 2003 before reopening for a while and closing for good in 2007 and has now been converted to flats. 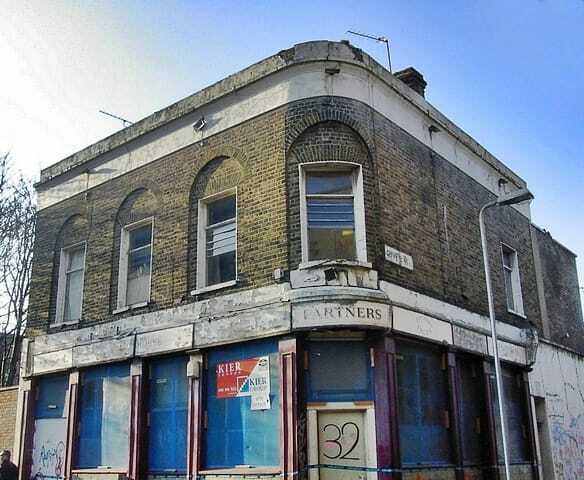 This Bethnal Green Road pub closed down many decades ago. It is now the Cowshed Spa described as "the place to go to for party prep and recovery treatments". 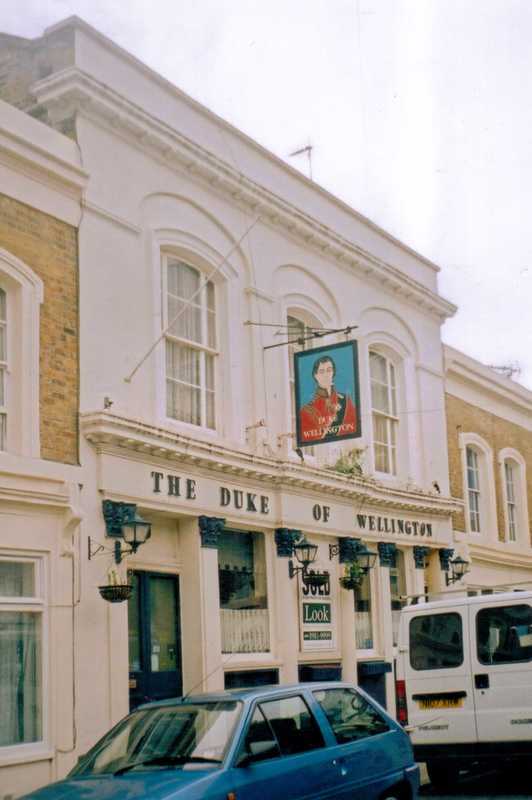 The Duke of Wellington on Cyprus St closed in 2005. It has been converted for residential use. 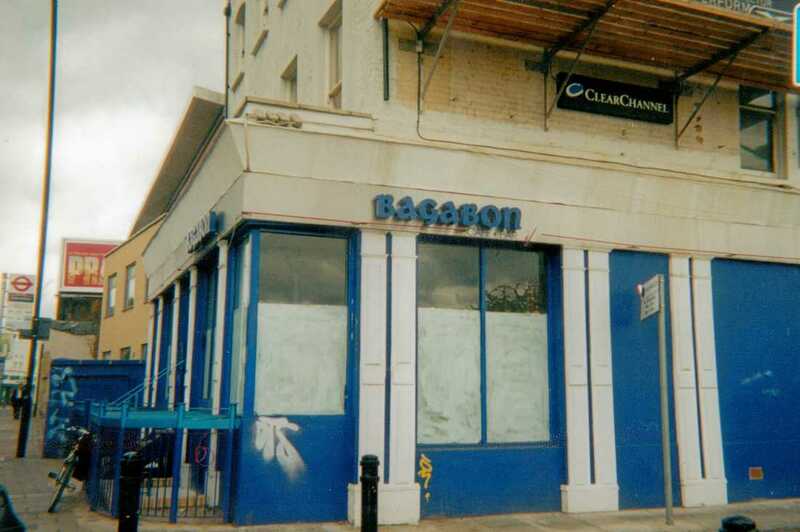 The Earl Grey in Bethnal Green Road closed in 2005 and the ground floor has been converted to a clothes shop called Shazna Collection expanding from their original shop next door. The building has had a roof extension creating a 4th floor & the adjoining buildings have been extended upwards to sympathically match this building. 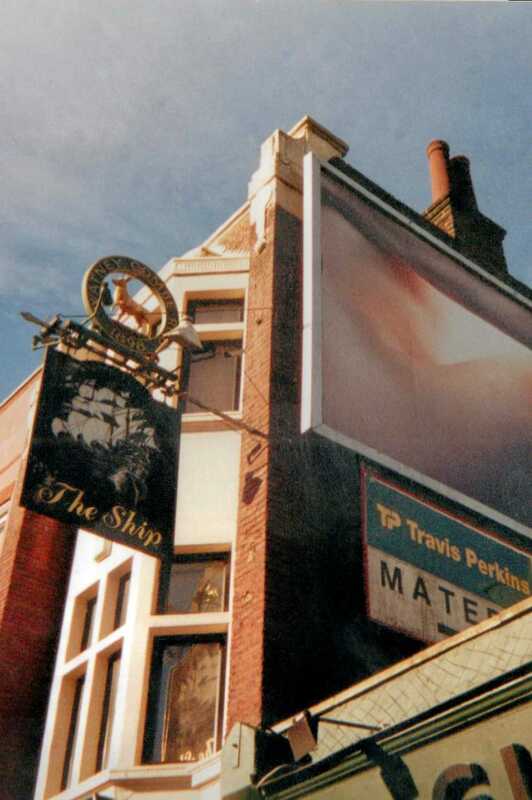 The Ship on Bethnal Green Road closed in 2000 and is now a London Community Credit Union. 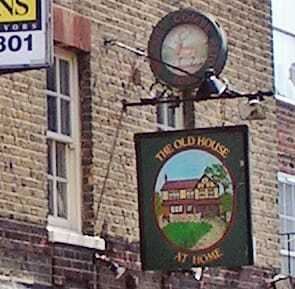 The pub sign survived for a few years afterwards but that has now gone too. This section is now divided up into 4 pages. 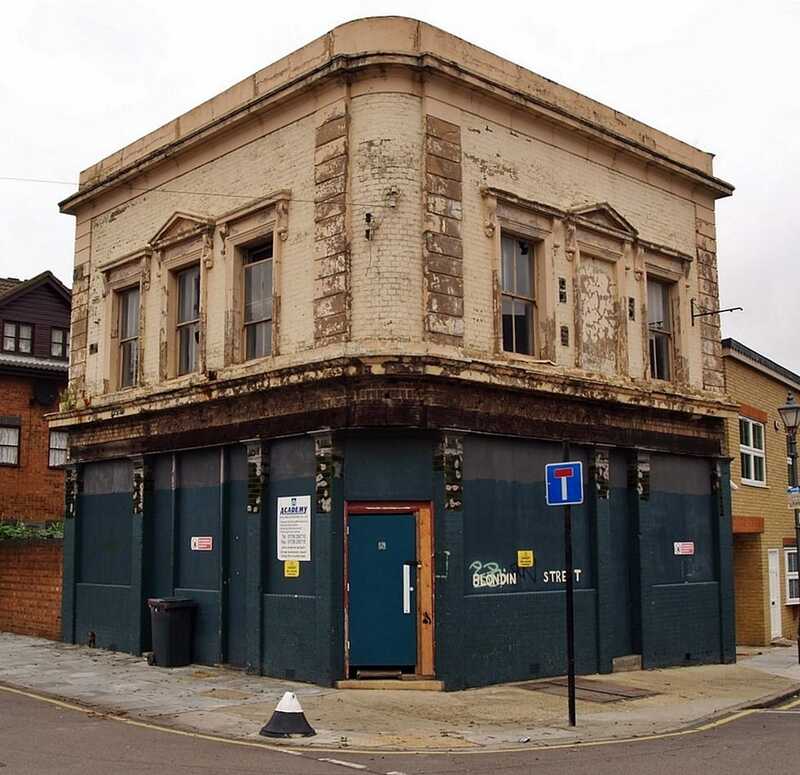 This page covers closed down and derelict pubs that have since been converted for alternative uses. 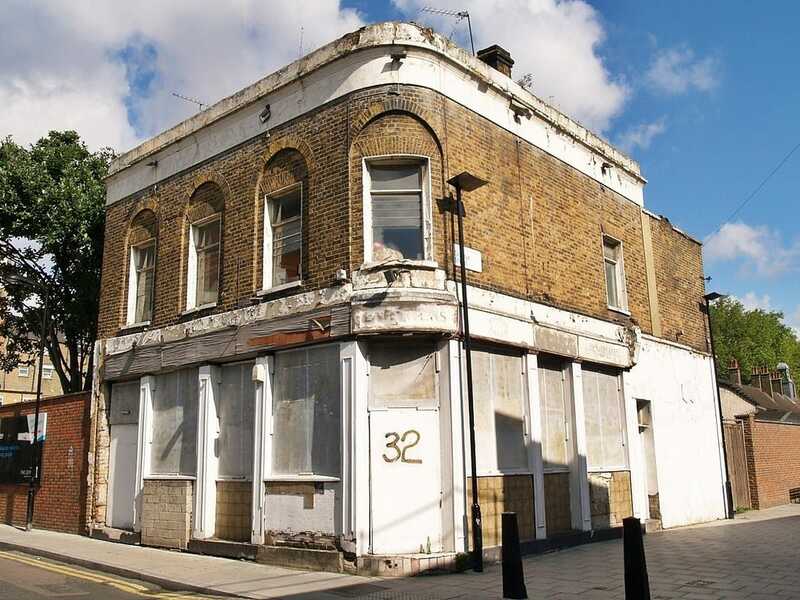 This is by no means a compresensive guide to closed down East London pubs - just a personal collection from the eary 2000s to present.